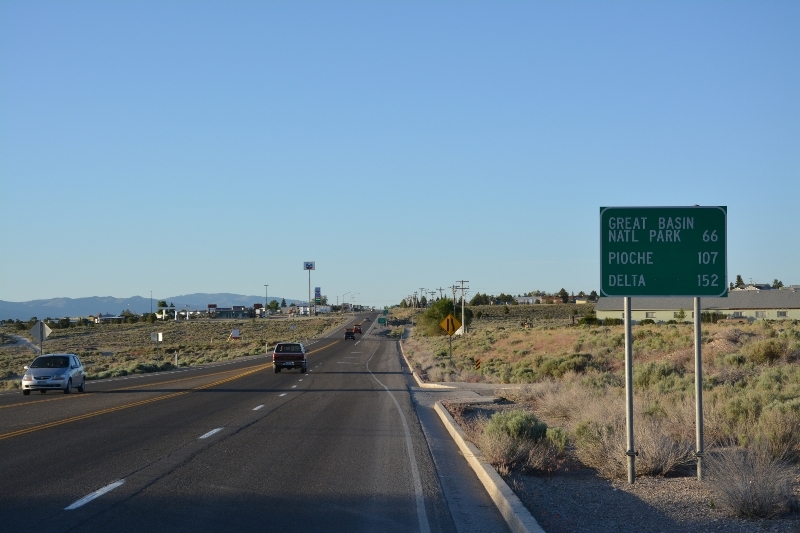 Today was a longer ride across to town of Delta. 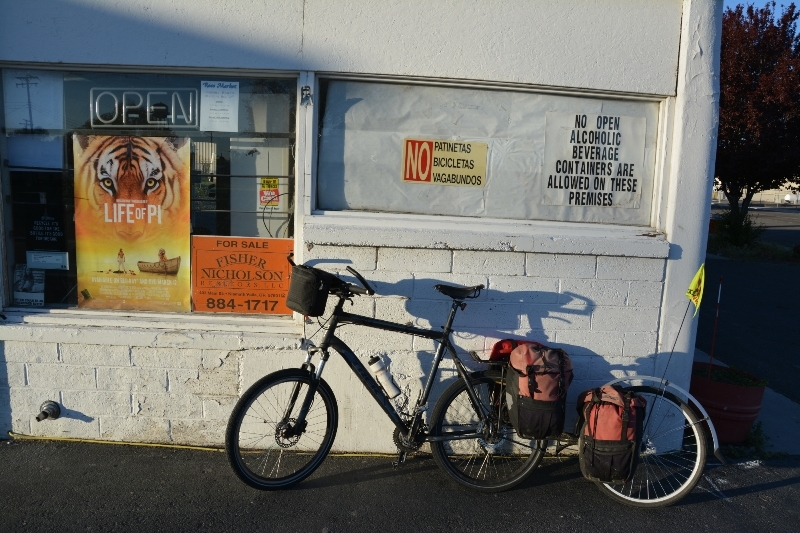 The sign indicated no services until Hinckley, so got some extra food in the panniers and set out early. My watch was now reset to Mountain time at the border, so didn’t seem quite as early though. It was flat for first 10 miles and after that a gradual climb with steeper after 18 miles and a summit at 21 miles. This summit didn’t have a name listed. It did indicate the grade on both sides was 8% but that seemed to be an exaggeration to me. The descent down the other side was nice and went through a canyon. It was also marked for 8% but didn’t seem as steep either. At bottom came to the next open valley at 31 miles and followed this valley for several miles before climbing again to a 41 mile mark and the second climb of the day. After the second climb I could see Sevier Lake to my right. 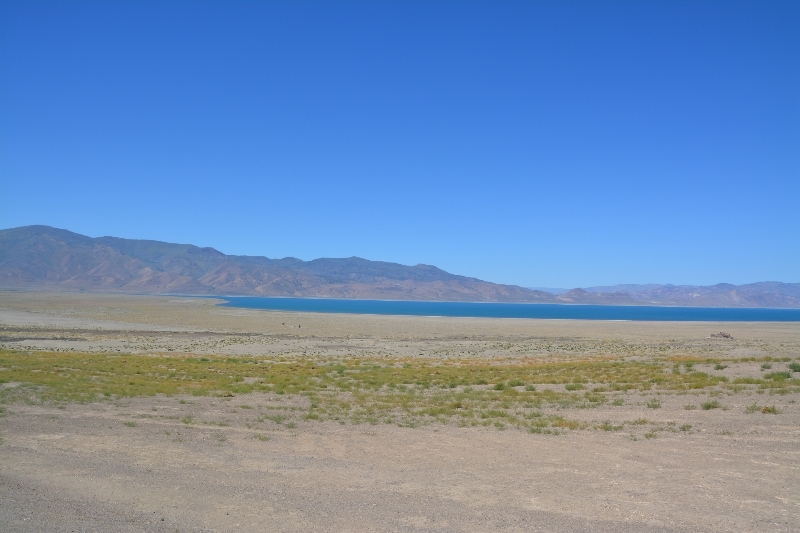 This dry lake seemed to be mostly salt flat. Unfortunately, the wind also picked up here and had a cross wind that was more of a head wind for most of the next 30 miles. It was first a slight descent to the lake and then a slight climb again from the lake. 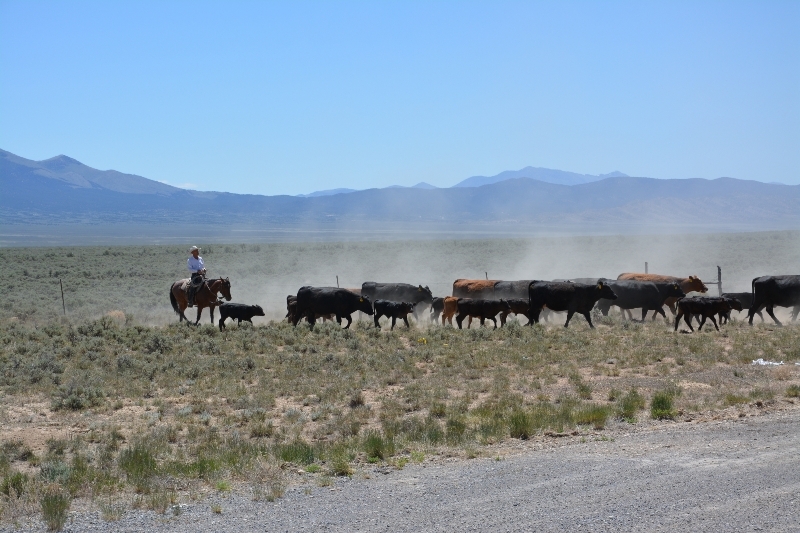 It was still sagebrush and open country after leaving the lake. 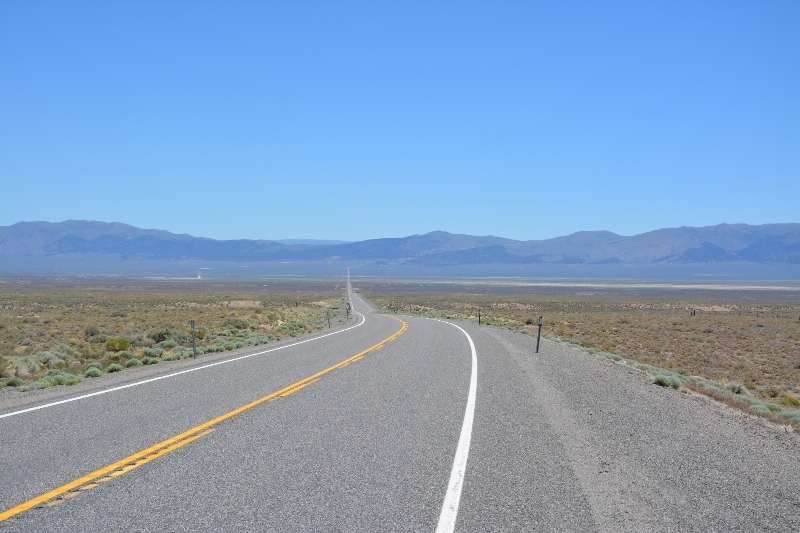 The road went straight for miles and miles without much in way of houses or other settlements. 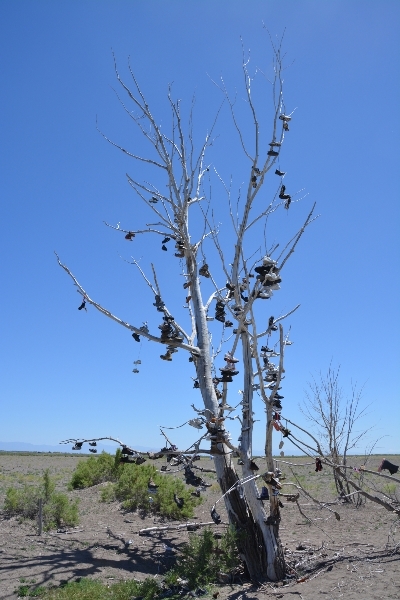 Finally as came close to 75 miles a few bends and then just before Hinckley saw another shoe tree. Which had some interesting exhibits. After that found a motel and booked in for two nights. Plan to take a rest day here in Delta since tomorrow is expected to be a bit warmer and otherwise this is good place to take a short break. 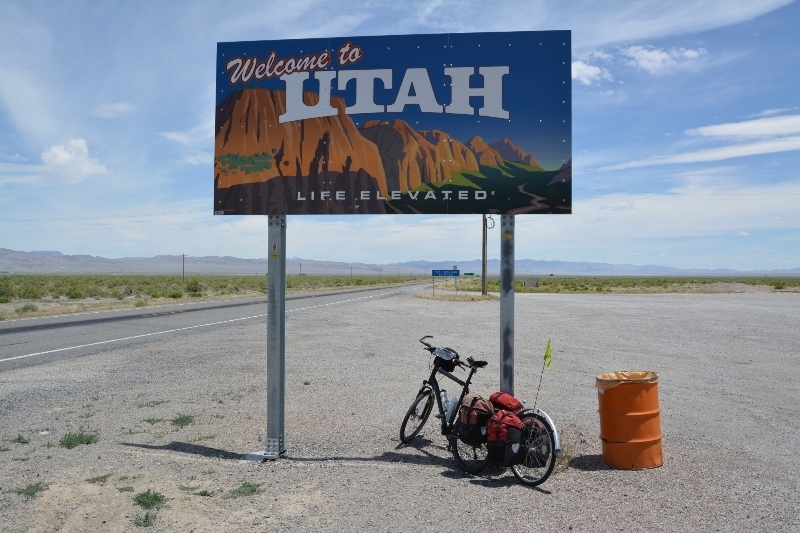 Today made it to the border of Utah. An easier ride today with only two summits to cross. This morning as I was cycling through Ely, I saw a deer cross the road. Wouldn’t expect that in a bigger town. 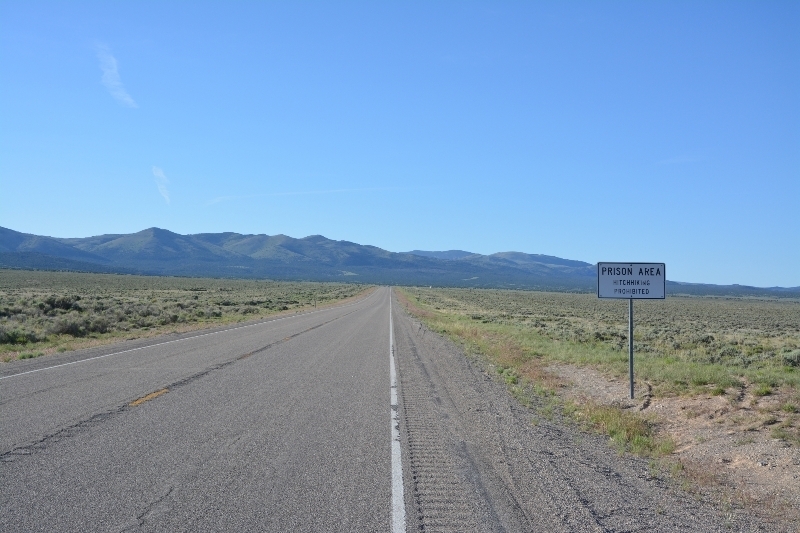 Just outside town, I briefly entered an indian reservation. However, it was small enough that one could see the “welcome to” and “leaving” signs from each other. Apparently, just enough to have a few businesses on the main road with rest of the reservation elsewhere. After this the route mostly followed a flat valley, including going past the prison south of town. 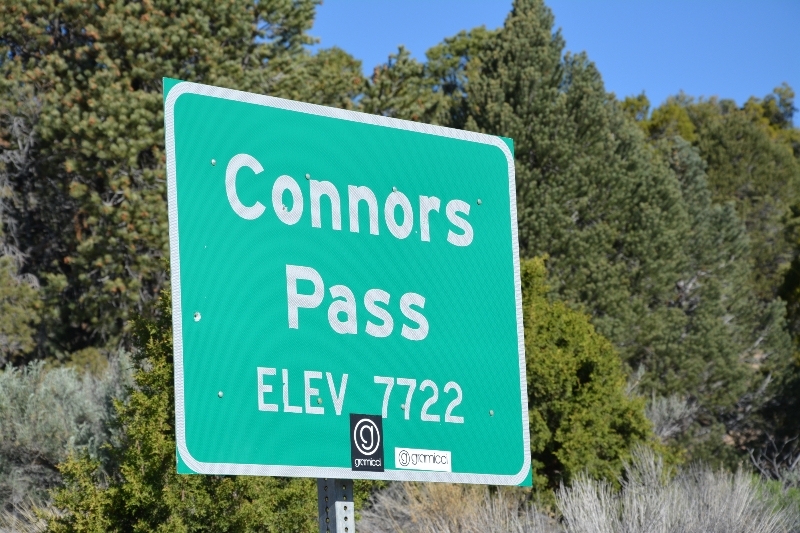 At 20 miles I was climbing and at 23 miles came to the first summit of the day: Connor’s Pass. 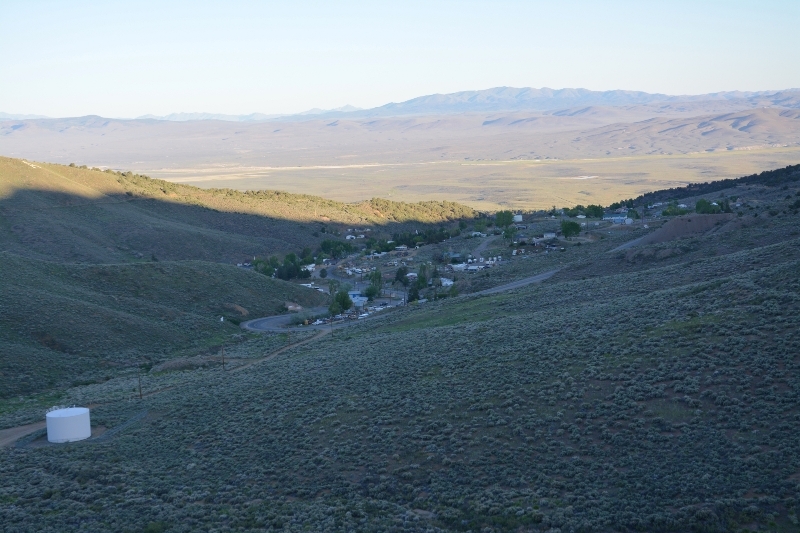 There was a good descent to the Spring Valley here and a place called Major’s Junction. The bar/restaurant wasn’t officially open, but were able to give me a coke and took a brief peek inside. Again dollar bills stapled to the ceiling. After this crossed the valley and went past a large number of wind turbines. Fortunately, winds mostly calm and hence they weren’t turning. 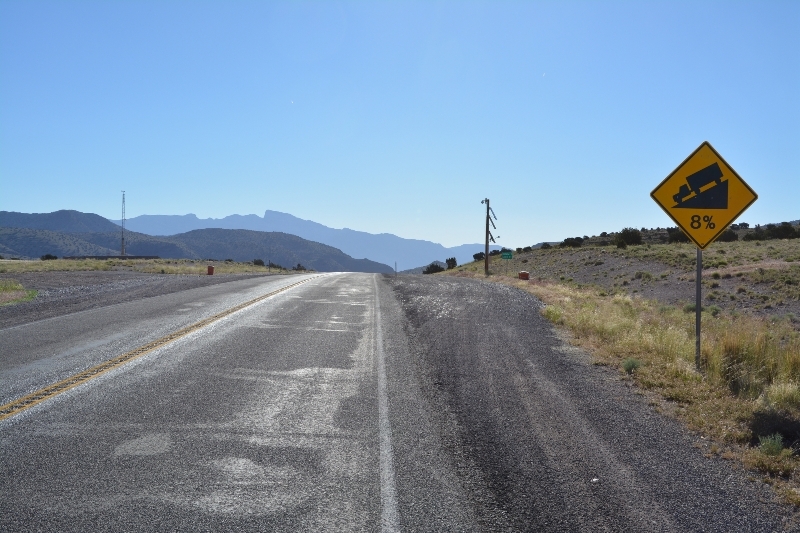 After this slowly turned right and started climbing again with the summit at 47 miles. This pass was lower but found it a tougher climb. 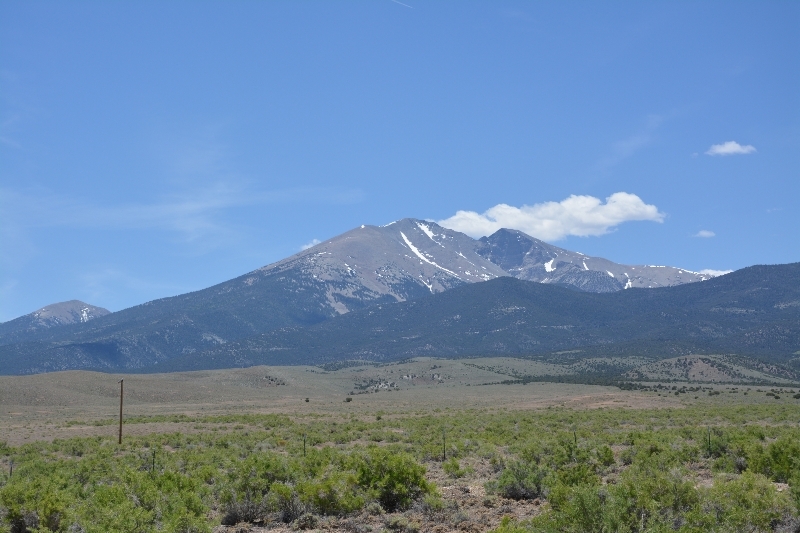 There were however some good views of Wheeler Peak. The descent from the pass was gradual. It also got a bit warmer. 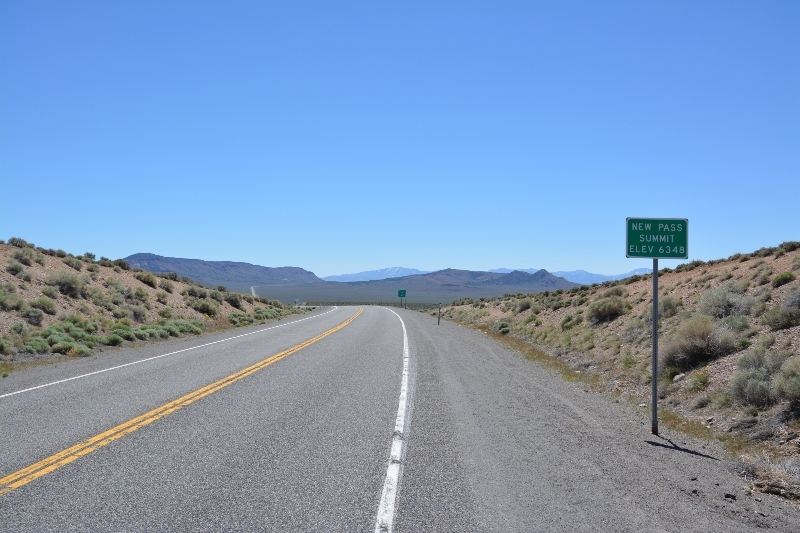 Here the routes divided and one road goes via Baker, Nevada and US 50 goes via Delta. 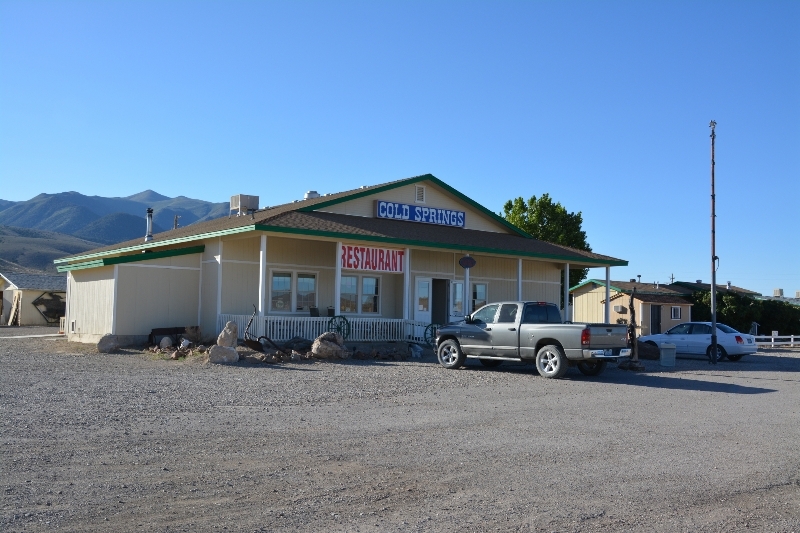 I took US 50 which brought me to the Border Inn. 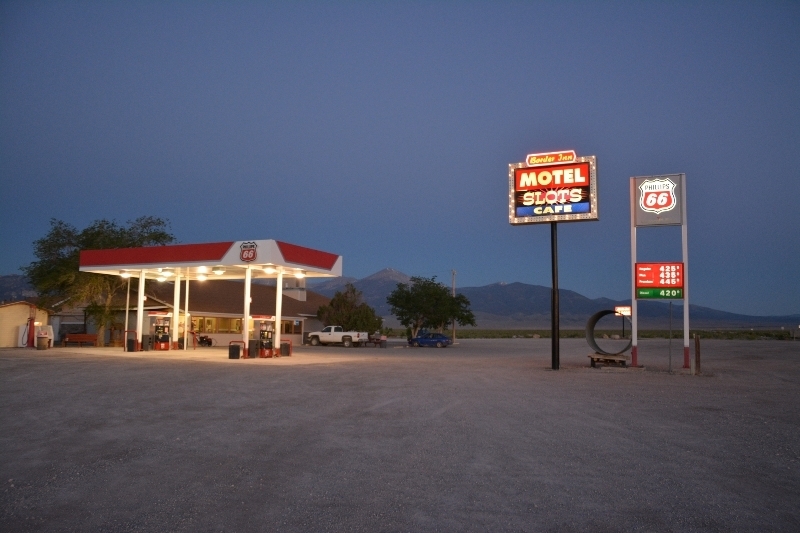 The motel and gas station are in Utah. 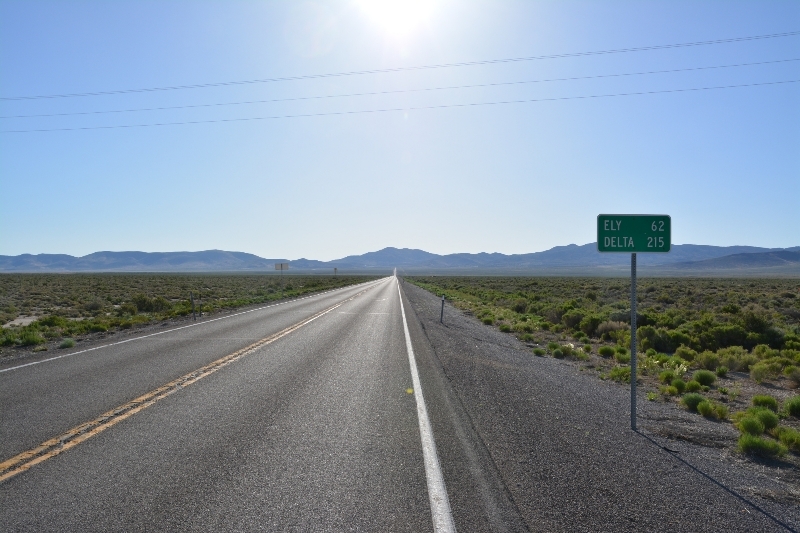 The casino is in Nevada. Unclear exactly where the restaurant is located. 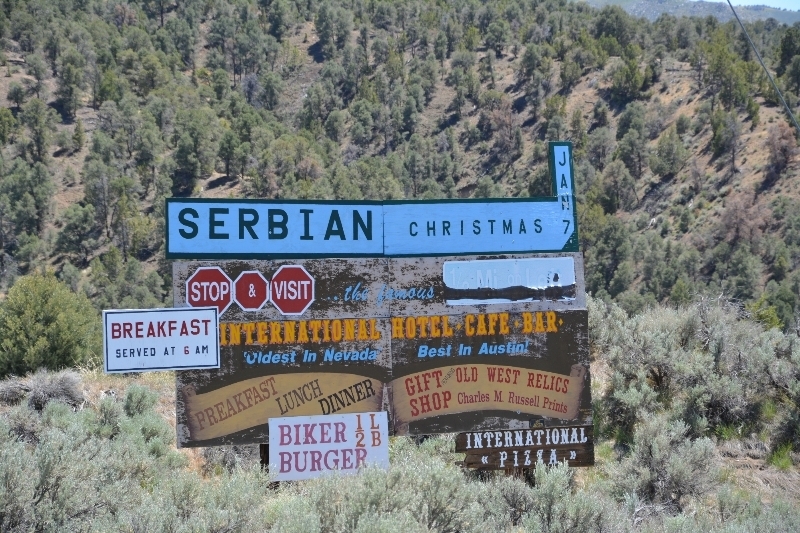 Here is a photo of the Utah border sign. This was good place to stop since there would be a gap here until next services. Today was a day with four summits to climb. Much of Nevada is long flat basins separated by low mountain ranges. The mountain ranges run north/south and hence taking US 50 means a lot of climbing up one range, descending and then crossing the next valley. There was restaurant in Eureka that opened at 5am, so had breakfast before I left. After that, the climbing started right away with five miles to the first summit. 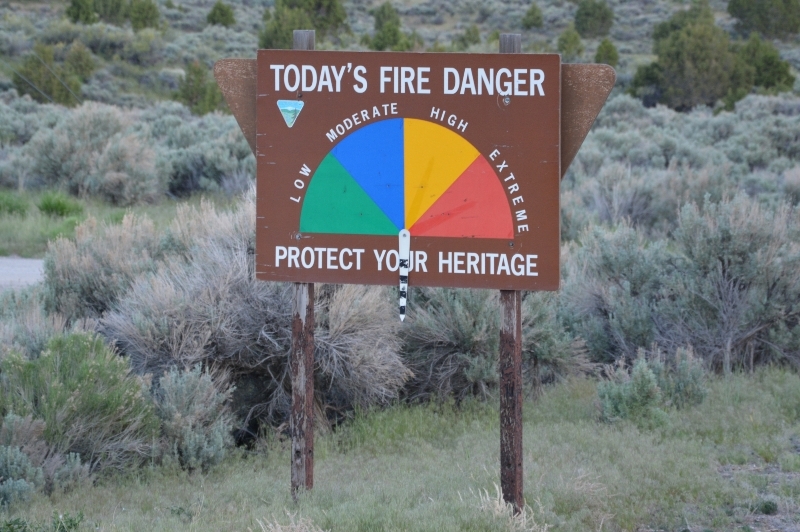 Along the way, not sure what a fire danger of down means. Without much difficulty, I was up to top of Pinto summit at five miles. One summit done and three to go. There was a good descent down from Pinto summit and down to the next basin. Here was photo taken after first 15 miles. The next climb was the smallest one and at 23 miles I was on top of Pancake Summit. From Pancake Summit there also wasn’t much of a descent, but went across the next valley and at 27 miles started a slow climb back up. 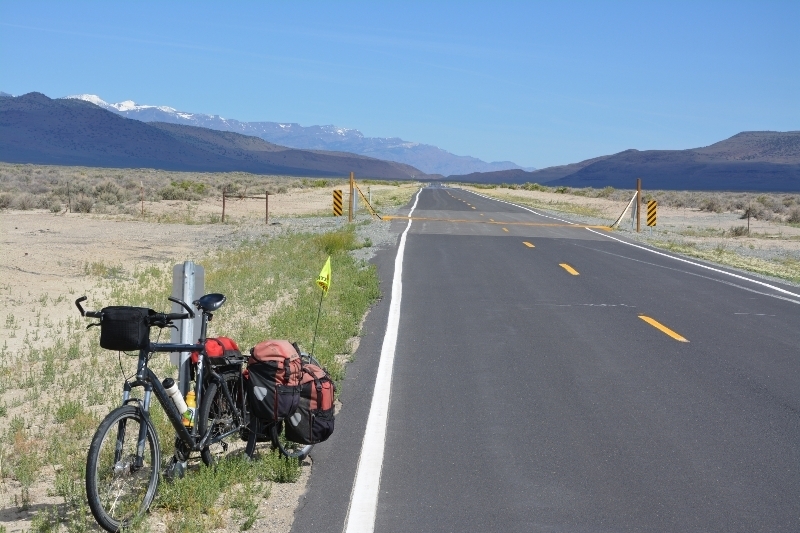 Along the way, met another touring cyclist, Peter who was coming the other way. He had started in Savannah Georgia and was riding to finish in San Francisco. On the way up passed the chain up area. 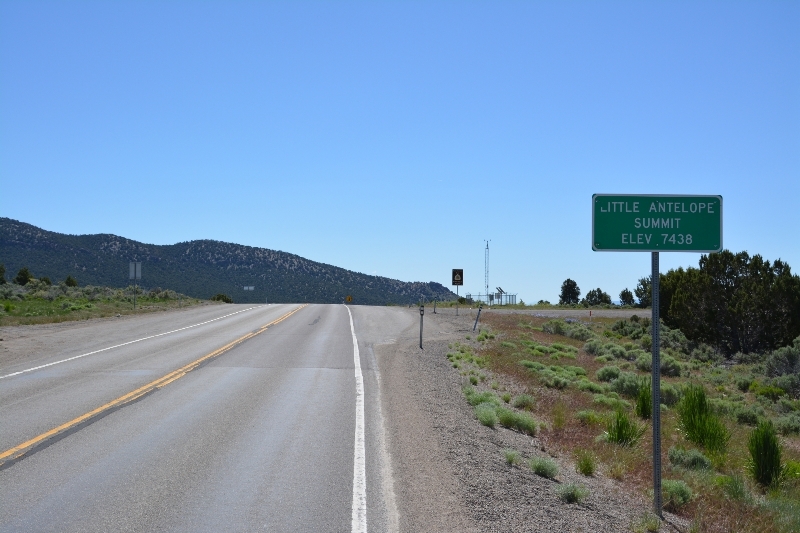 At 36 miles I was back up top again, this time on Little Antelope Summit. Was still riding pretty strong and with half the ride done, had crossed three of the four summits for the day. The descent went down to Jake’s Valley and this is where I found some folks driving cows from horseback. 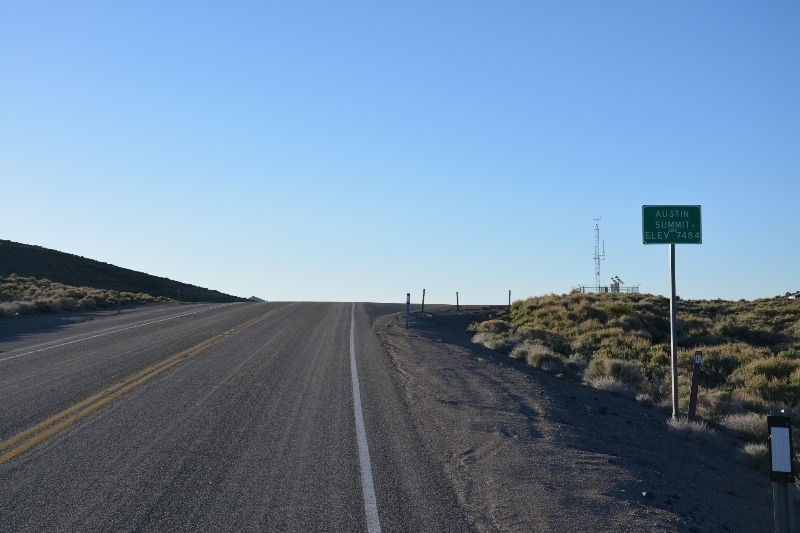 At mile 50, started a gradual climb again and by mile 60 was back up to the next summit at Robinson Pass. 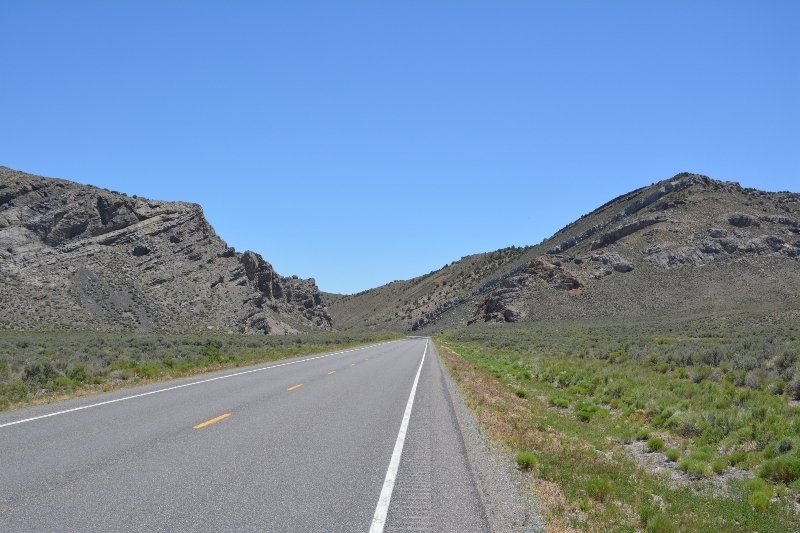 The last few miles brought me through a more narrow canyon and on other end was in Ely. The four summits had been some climbing but overall wasn’t as bad as expected. After the summit, two miles of descent that signs said were 6%. Once at the bottom, another climb back again to Bob Scott summit. There was campground and historic sign about early surveyors here. Once again a good descent though this one was longer. 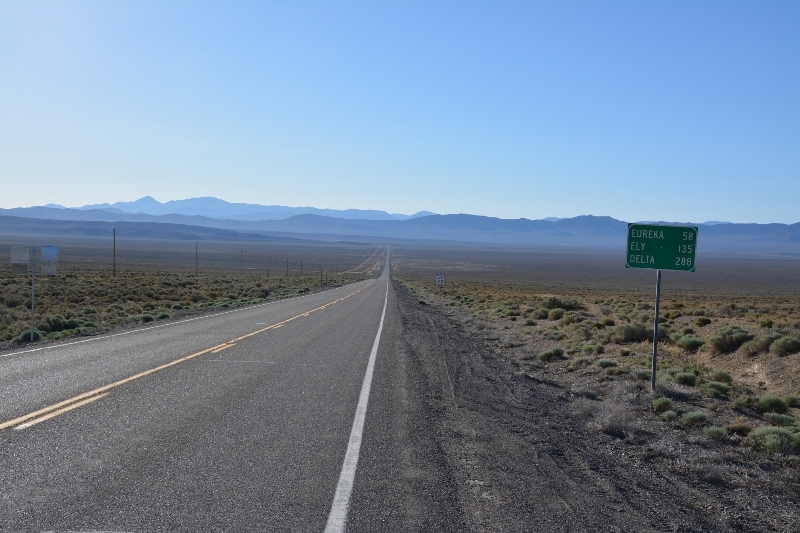 At 12 miles came to a road intersection that indicated “loneliest golf course” was an hour south. Also here entered a long flat valley. Not too difficult to cycle across this valley and as I approached the other end, it slowly started climbing again to reach Hickison Summit at mile 24. After the summit, only a slight descent and mostly flat as I rode through this next valley. 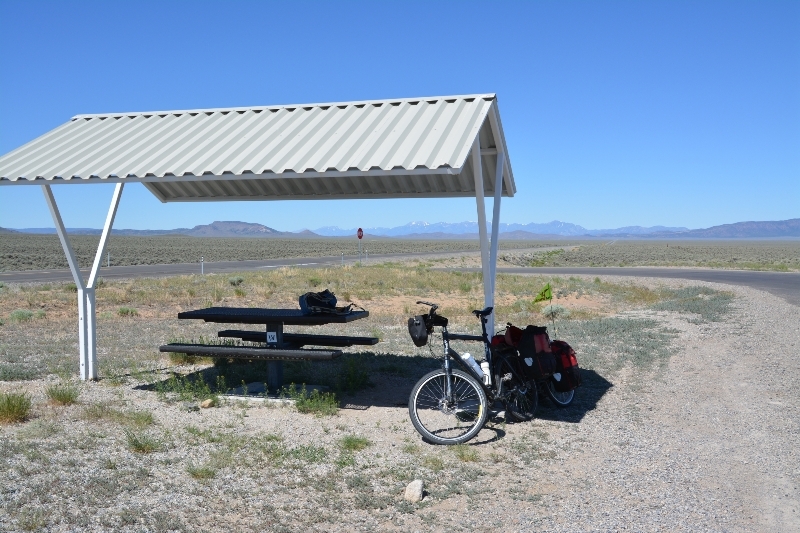 I stopped briefly at 37 miles at the rest area for a bite to eat. Otherwise kept going on this route. 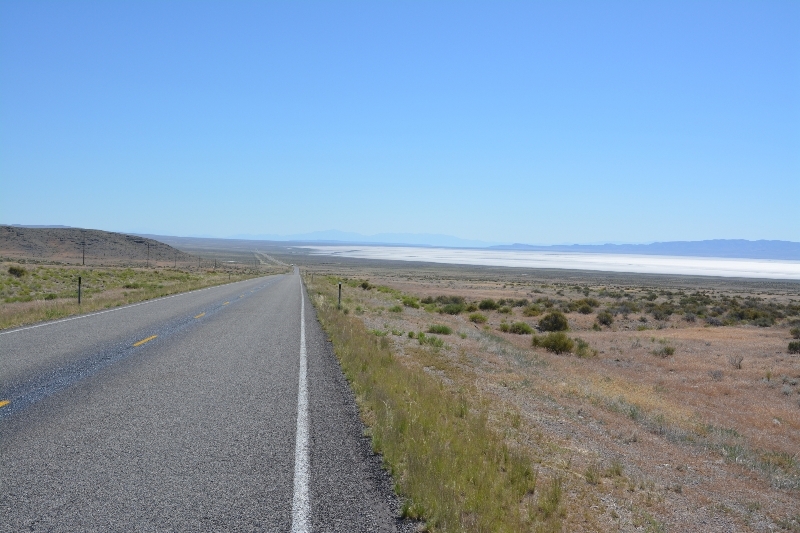 As I got closer to Eureka, the road had a few more ups and downs and also came through some more narrow spaces. However, nothing too difficult and by early afternoon I had reached Eureka. 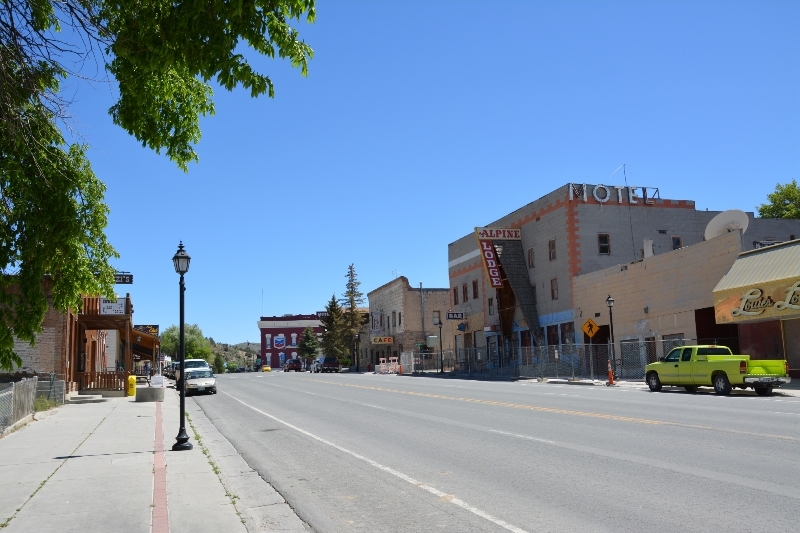 The town itself was pretty quiet, though I did find folks inside grocery store and cafes in town. I expect a little more climbing tomorrow. Today was a nice ride with a few climbs. The last one into Austin was particularly steep but overall not so tough of a day. I’m glad I broke the Fallon-Austin gap into two days. Middlegate was a bustling place with a surprising number of people stopping through. It was all pretty quiet when I set off at sunrise though. 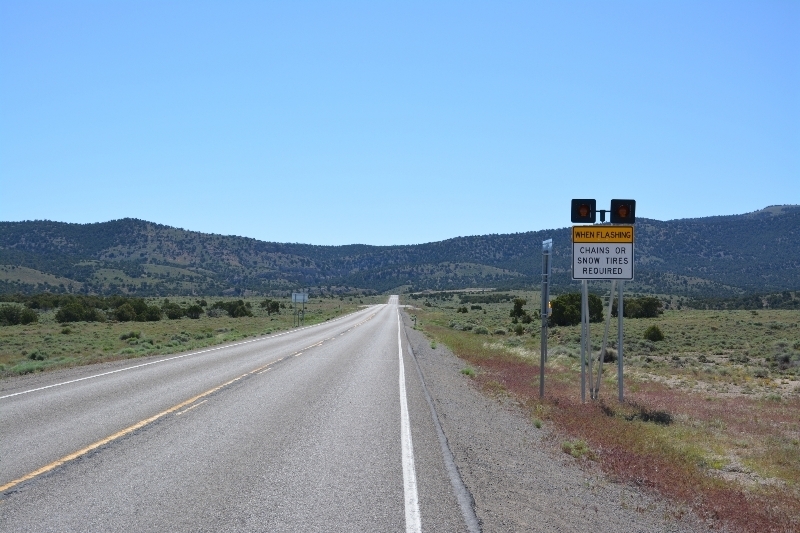 At just 3 miles there was junction in the road and I decided to stay on the main US 50 alternative. 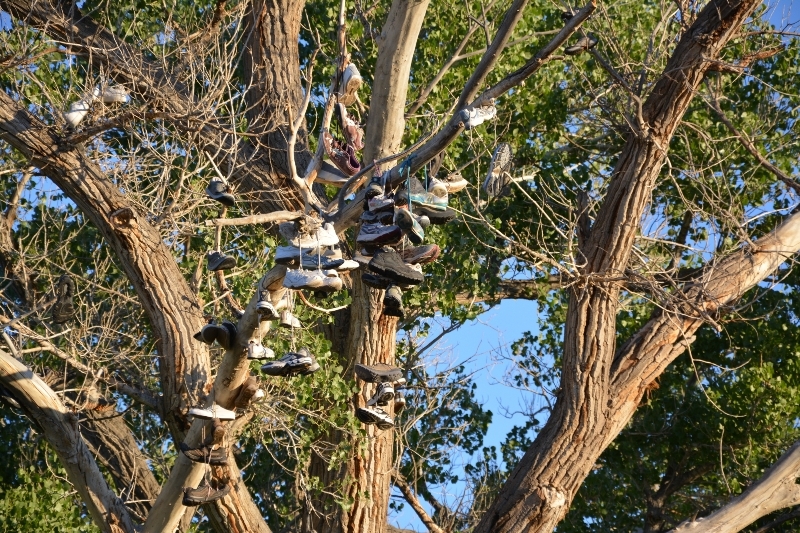 Also before the junction was the shoe tree, with hundreds of shoes up on the branches. A closer look shows these shoes as well. After the shoe tree, the road continued a slight climb. 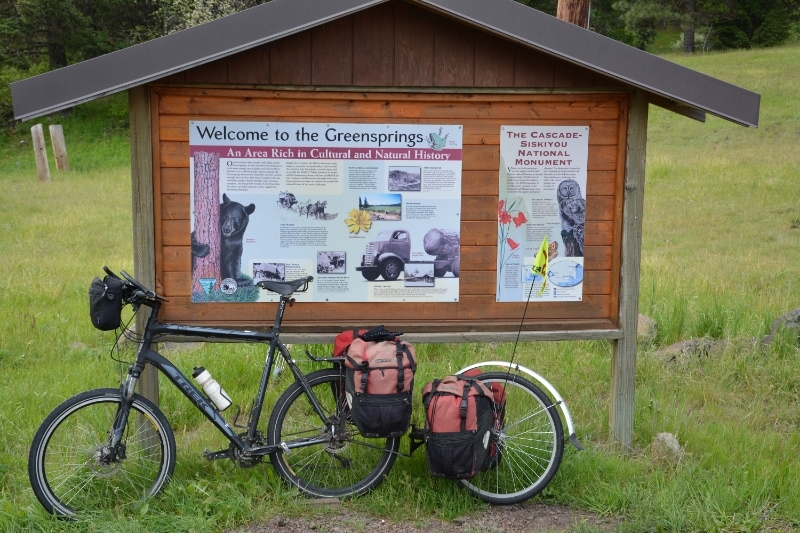 This brought me to the Cold Springs stop at mile 14. It was before 8am, the official opening time, but I was still able to stop in for breakfast. It looked different than I remember and was told the old station had burned down in 2008 and been rebuilt in 2010. After Cold Springs the road was a little more level. Still wide open valleys without too much extra to see. Slowly getting closer to Austin. 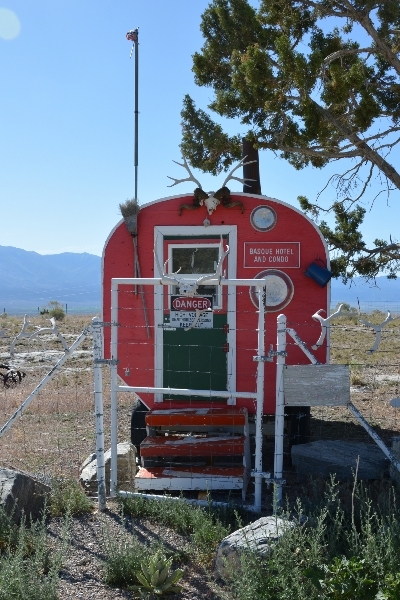 Started to climb again in a few miles and this brought me to the New Pass summit at mile 40. There wasn’t much descent from here before started to climb again to Mount Airy summit at mile 46. A bigger descent here and one could almost see the road for rest of the way into Austin. It was a long slow ride down and then a slow climb coming back up other side. 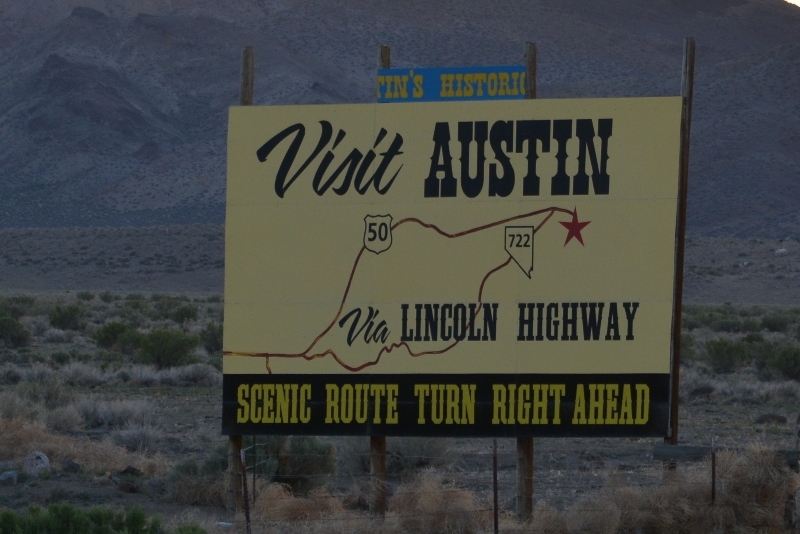 As one got close to Austin it became steeper, though also had new business advertisements. The motels in town had “no vacancy” signs though one of them said they had a reservation that wasn’t reconfirmed, so got a room there. Otherwise found the international hotel cafe for a later lunch and relaxed. Expect the climb tomorrow morning will be challenging again as it is pretty steep. Today was an easier day than expected. 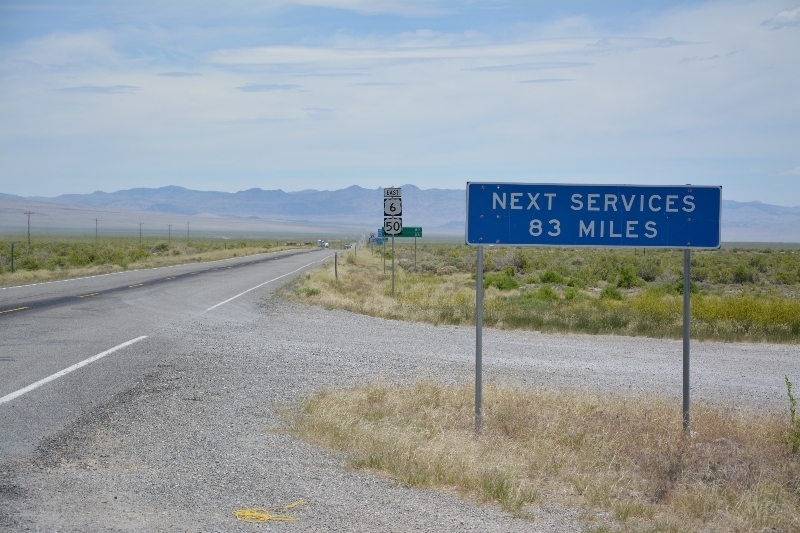 There is a gap of ~110 miles between Fallon and Austin. In 2002, I had cycled that distance but found it pretty challenging, particularly with a lot of climbing. 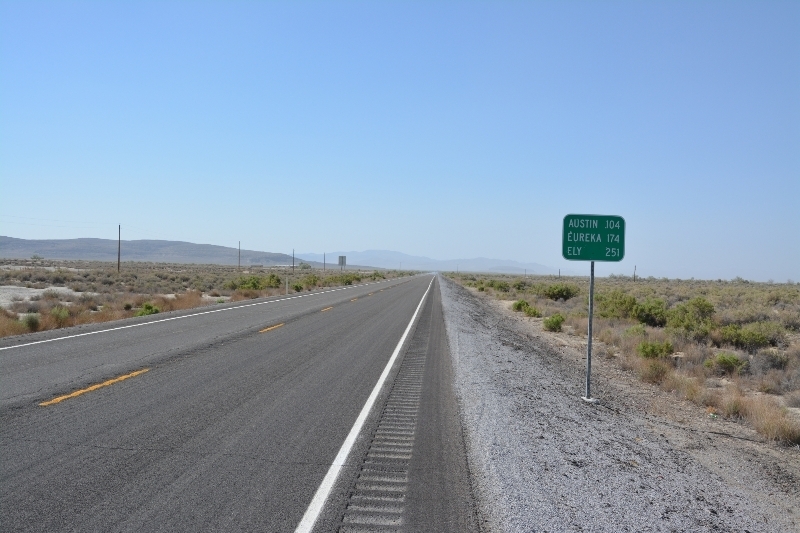 Hence, this time decided to split it into two days along with an additional 28 miles from Fernley. Last time I had also discovered Middlegate as a possibility to stay along the way. Once again on the road early. Alt-50 was a four lane road with a good shoulder. 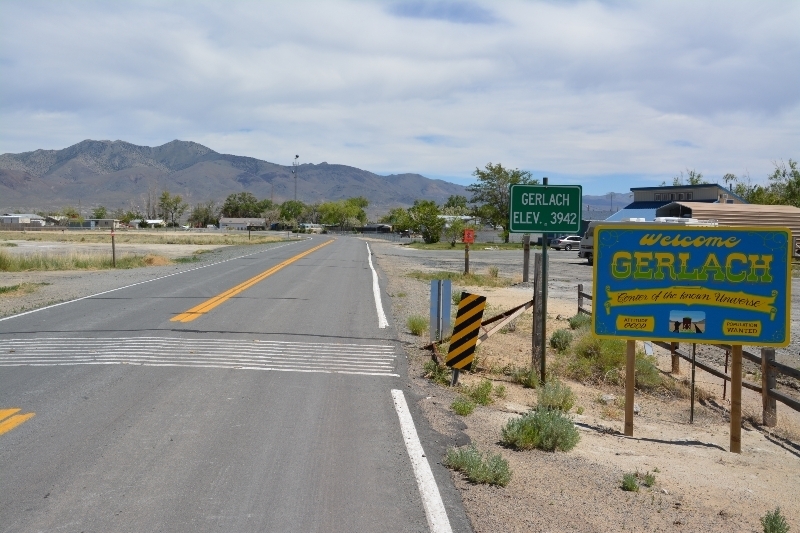 First several miles were residential parts of Fernley. 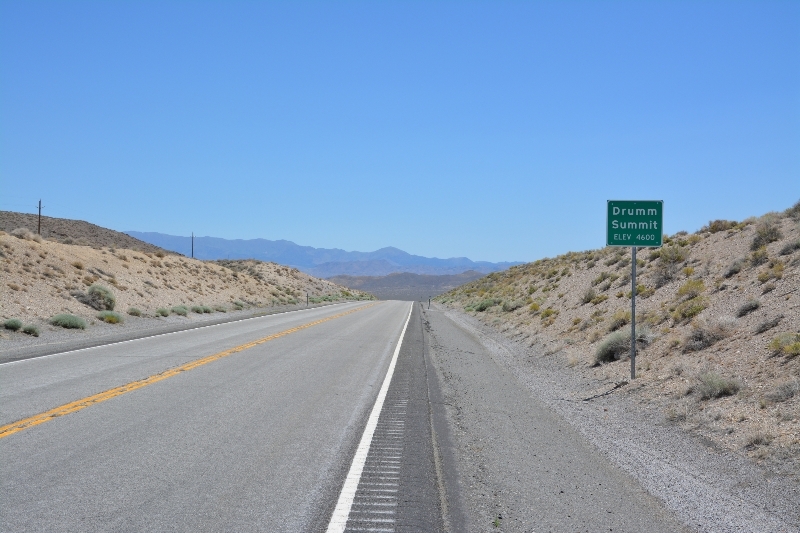 After that open desert areas until mile 18 where the road joined US 50. 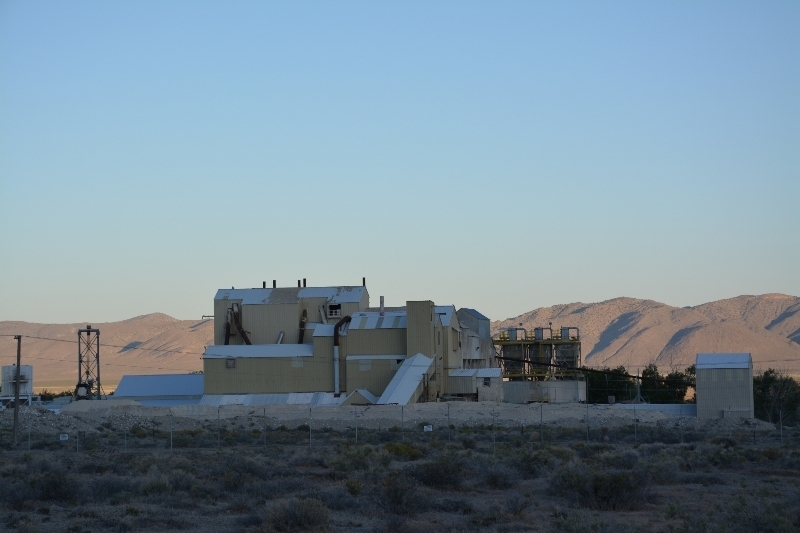 After that already some town areas of Fallon. 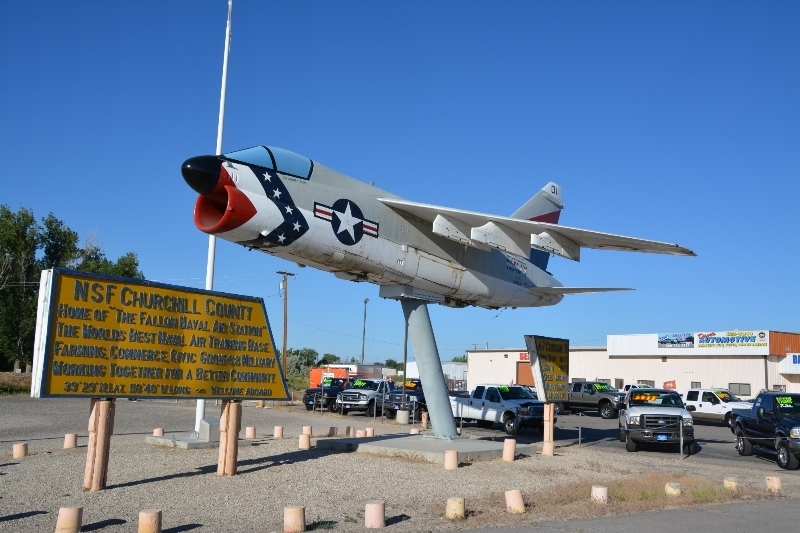 Fallon is site of a Naval Air Station. I didn’t see much more than the plane below in town, though I did ride past some of the bombing ranges later in the day. The primary street is “Maine” street spelled with an “e”. 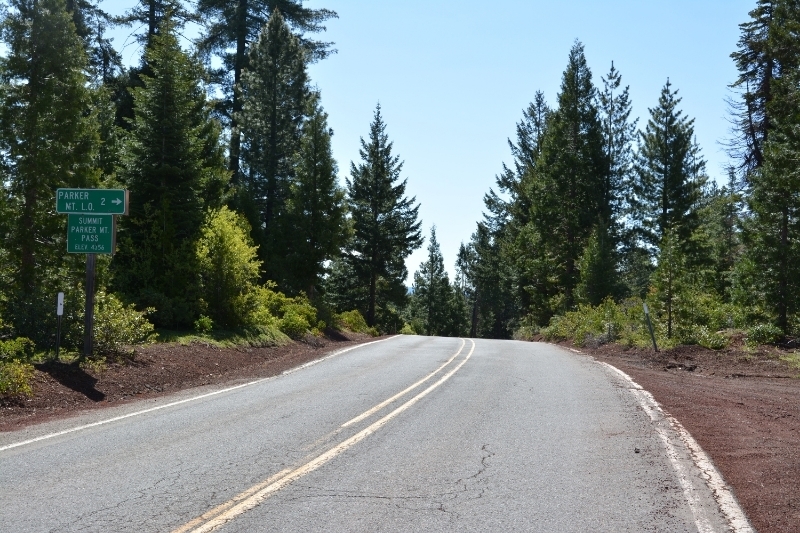 The road became narrower after Maine Street and there were some obnoxious rumble strips. 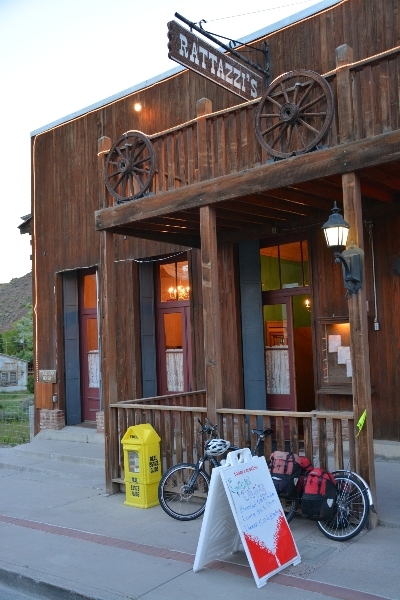 At mile 32 was Harmon Store and last place to get anything for a while. 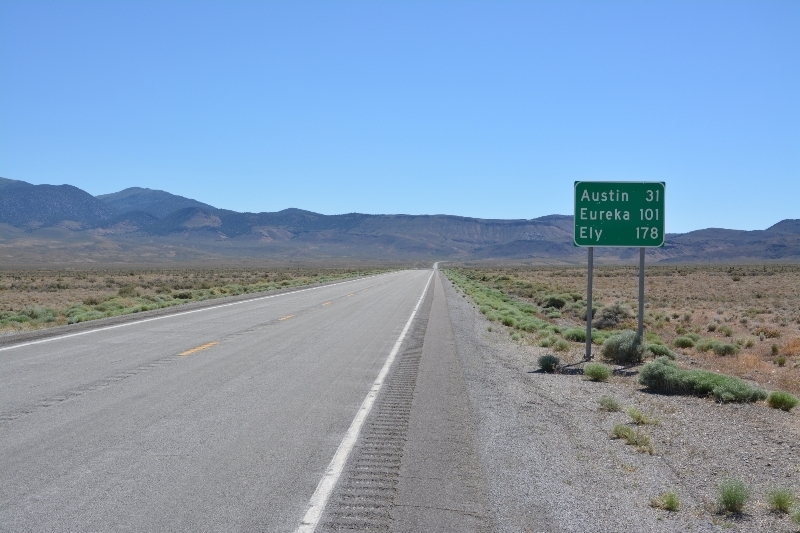 The road became wide through desert and signs gave me my next several destinations: Austin, Eureka and Ely. The road was still flat. 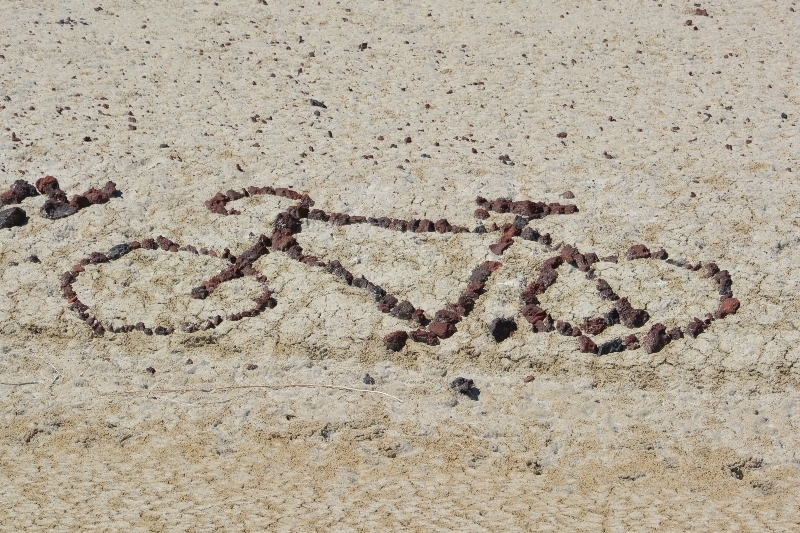 Along the way, people had spelled different words and pictures with rocks. Below is one of a bicycle I found. At mile 52 I came past Sand Springs. 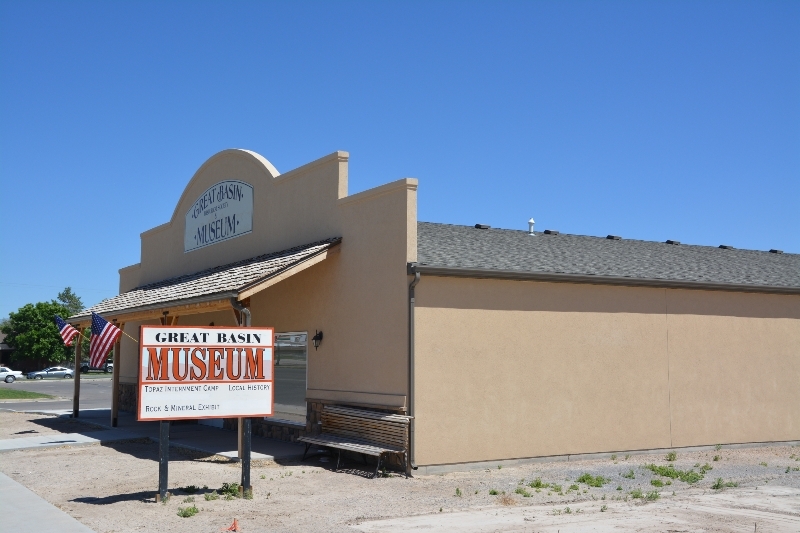 This was location of a large sand dune as well as indication of a pony express station. 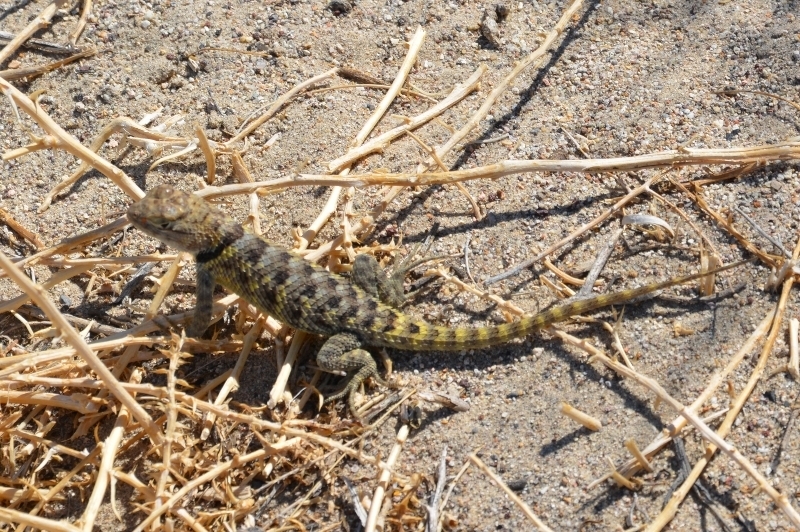 I didn’t cycle into the dune, but did spot this lizard nearby. 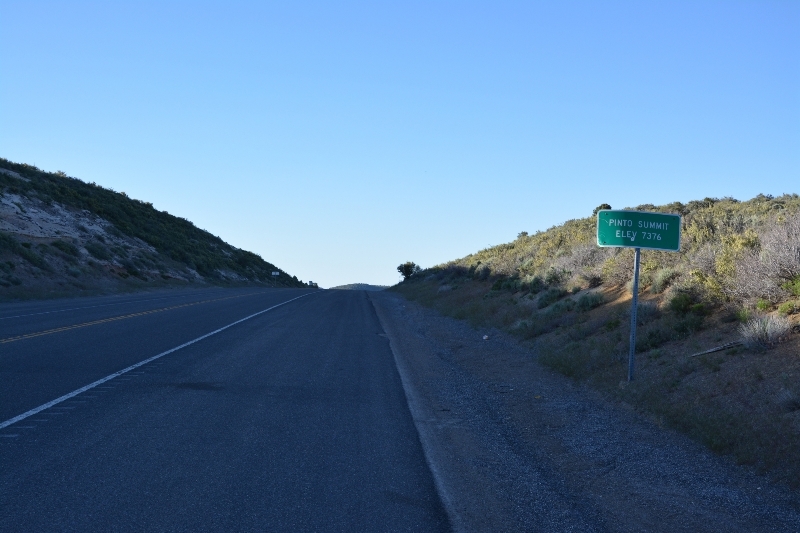 Also at this point, the road started its first major climb. 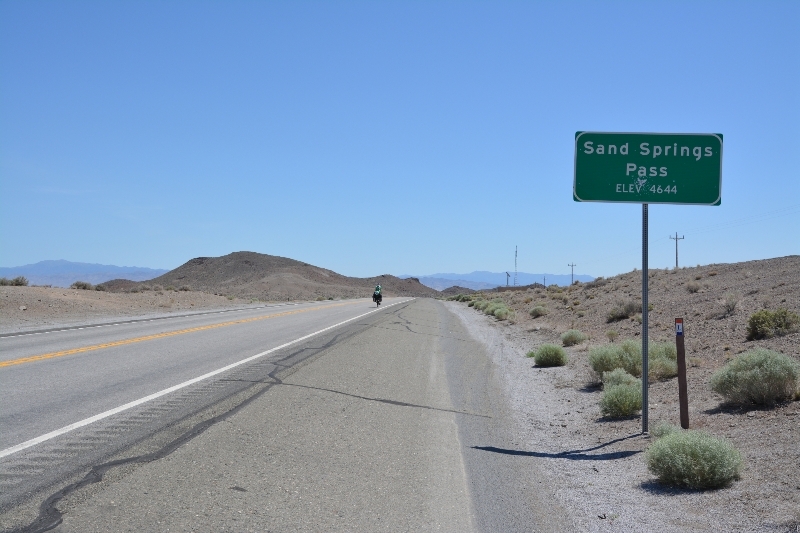 A few miles of slow climb brought up to Sand Springs Pass. Look carefully at photo and you’ll see another cyclist ahead. 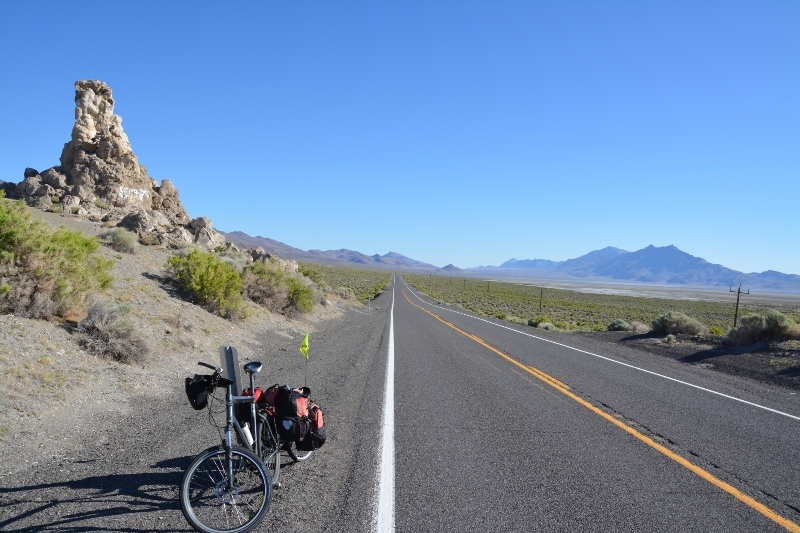 Denise was cycling from San Francisco to Virginia on the Adventure Cycling route which goes along this way. Fun to meet up with another cyclist. After this another descent and then a climb up then next ridge. Without much difficulty started a slow climb again which brought me to the Middlegate Station. 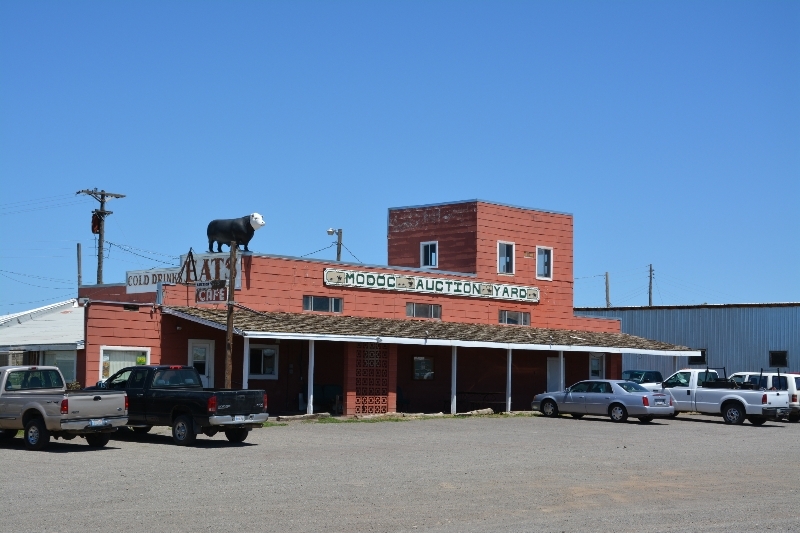 This is another historical pony express stop as well as bar, motel and restaurant. Surprised to even find wifi access now. Also a good place to stop for the day since signs indicate Austin is another 64 miles ahead and I believe a fair amount more climbing to do. Brunos didn’t serve breakfast until 7am, so I had some crackers, peanut butter and fig newtons before heading on the road. Today I expected a store at Nixon, 60 miles down the road but decided I’d rather have the early morning cycling than wait too long. 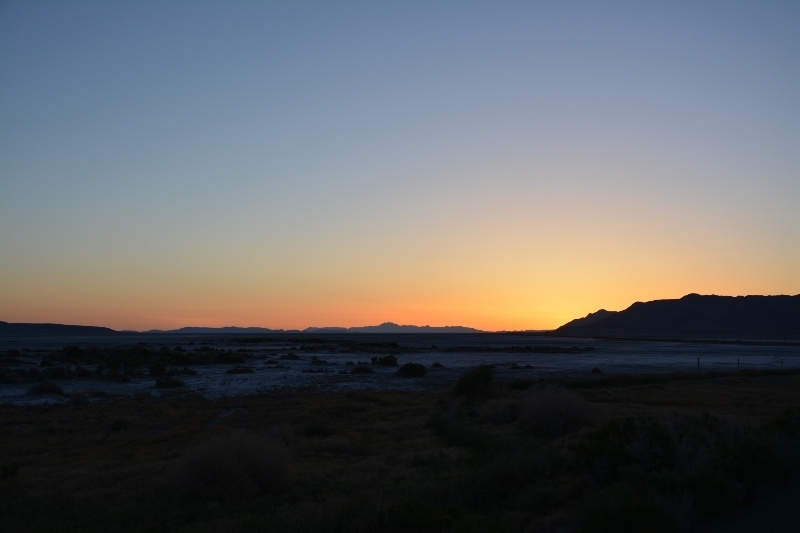 Photo above showed the sun barely coming up. 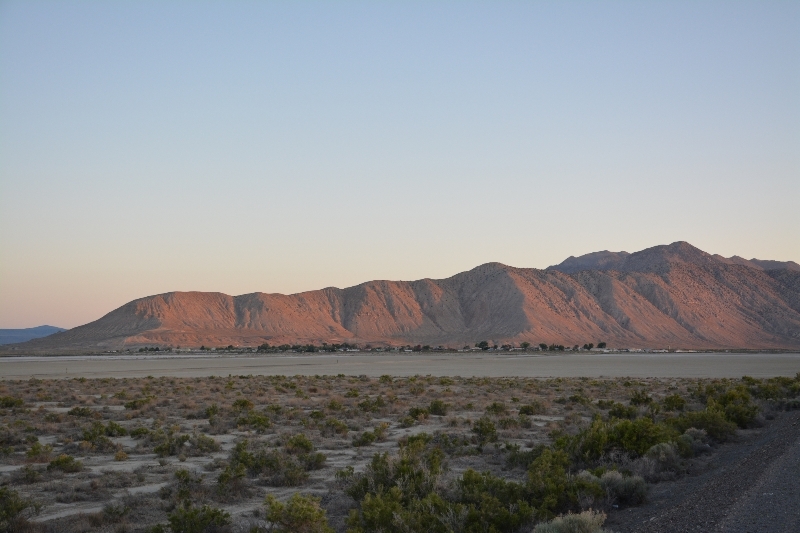 However, it rose quickly and this photo shows a look back at Gerlach in early morning light. 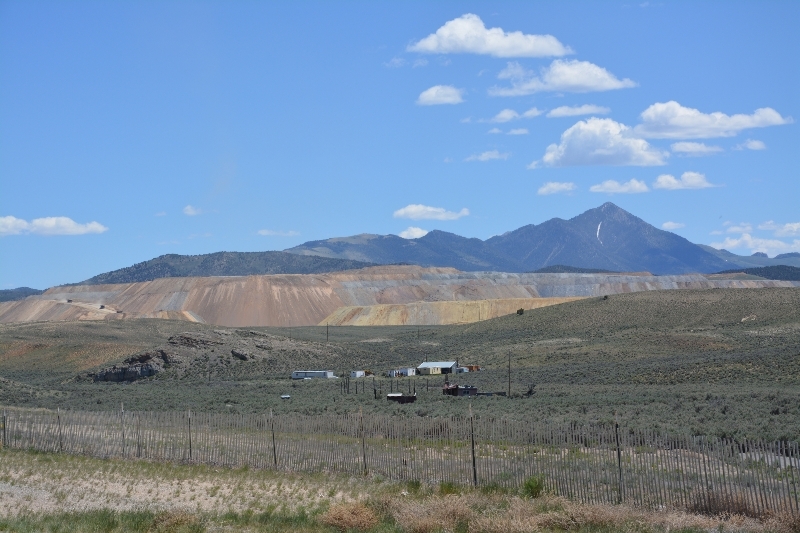 Five miles down the road was Empire and site of a gypsum plant that had closed recently (2011). The store here was closed. Behind it I could see a contraption complete with palm tree that looks like it might have been for burning man. After this, the route mostly followed the valley, though would climb along the edges as well, so wasn’t completely flat. It was otherwise a good road and not much else along the way. 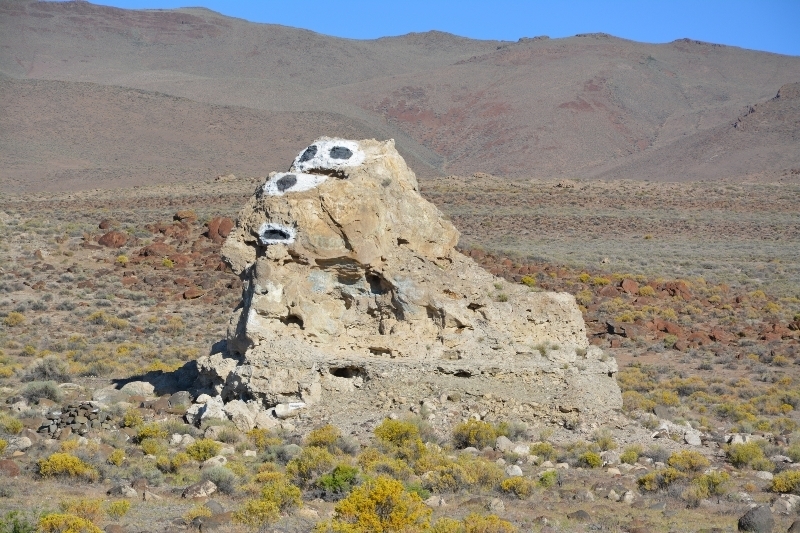 Some folks had fun decorating one of the rocks with paint. This entire area was indian reservation. 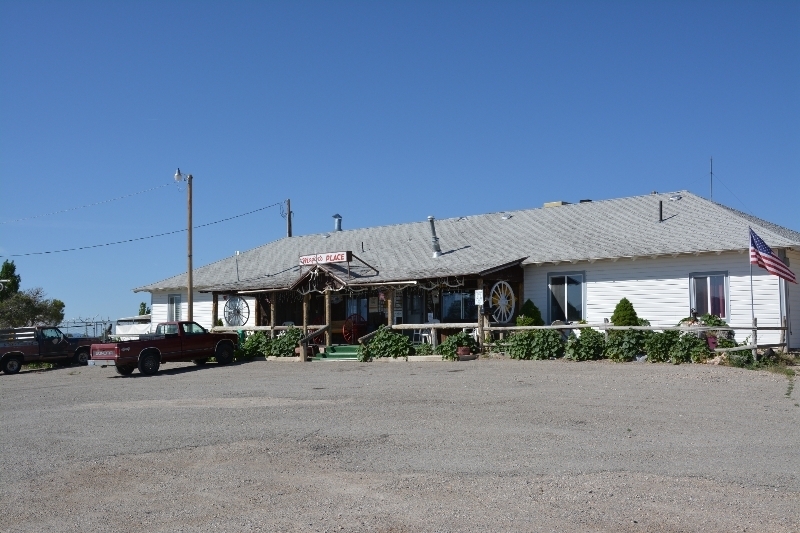 Once past the lake, there was a store at 60 miles and good place to stop for lunch. 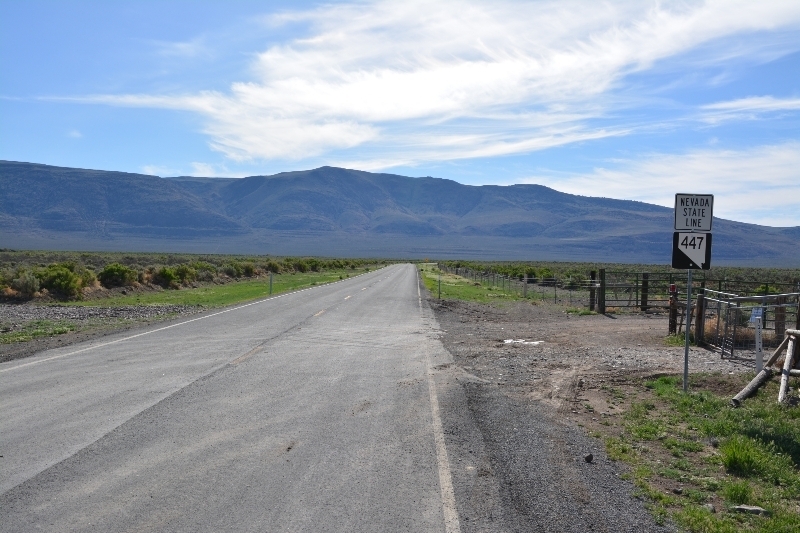 From here the route climbed the last drainage out from the lake and then over into Wadsworth and then into town of Fernley. 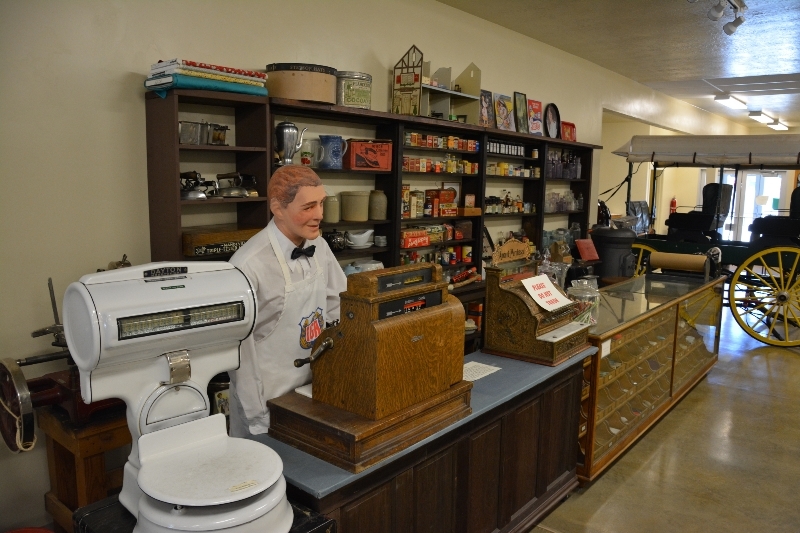 This town was on I-80 and hence had a collection of larger businesses along the interstate. 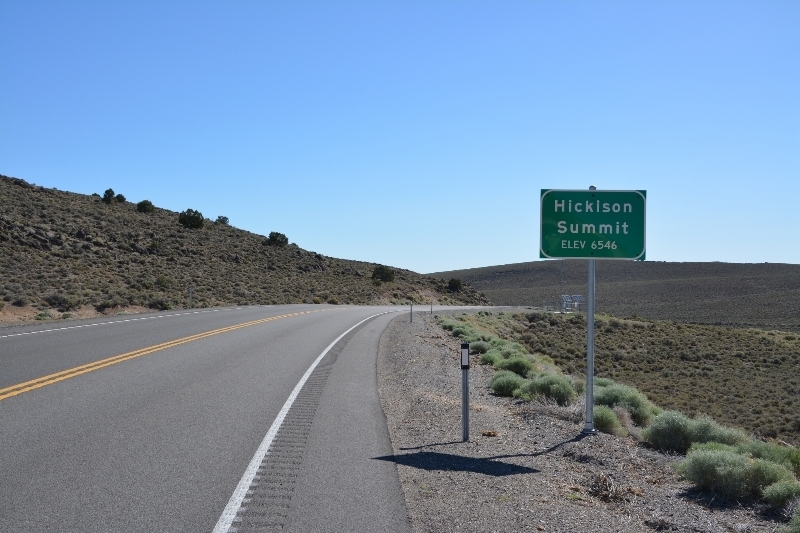 Also a good place to stop for the day and plan out route along US 50 from here. 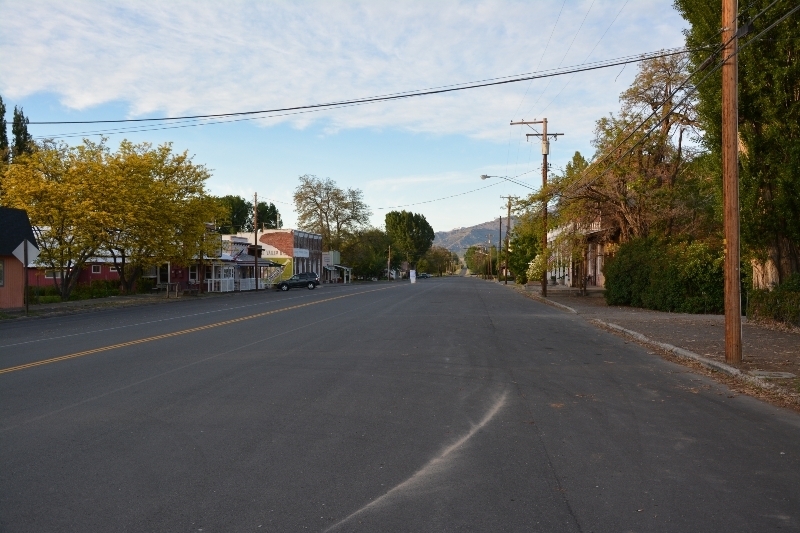 through Cedarville where photo above shows the main street. of the distance in California. also after the climb. Still pretty reasonable cycling though. Today was a good ride with flat at the beginning and climbing at the end. It was just above freezing when I got on the road. 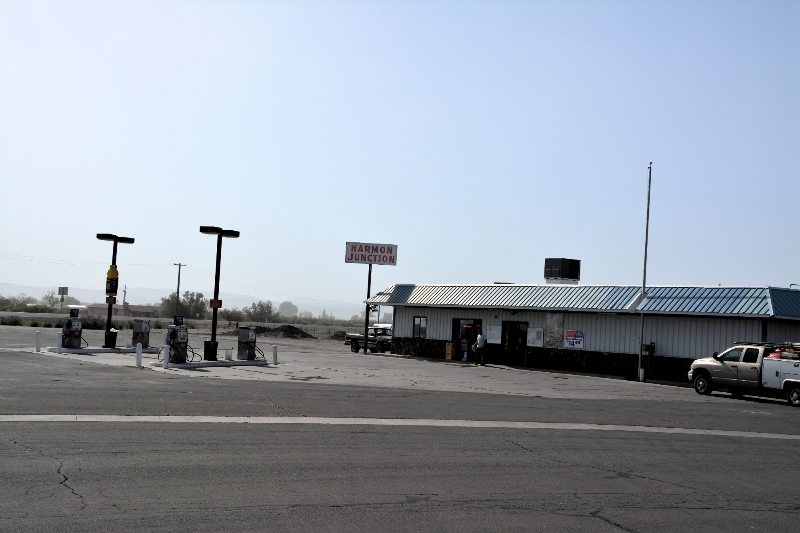 The folks at the motel had called to determine that the market in Tulelake opened at 6am, so waited until just before then to take off. Sign above showed the town in early morning. Somehow the market hadn’t opened by 6:15am so looked further in town to find a second market. Along the way, I also saw a local cafe. Four patrons were already there drinking coffee and looking at the newspaper. However, they told me breakfast wouldn’t be served until 7am. Guess they were the “regulars” who came down each morning an hour earlier. Photo above was taken at the second market. I don’t have roller skates but was amused at the other two parts on the sign. 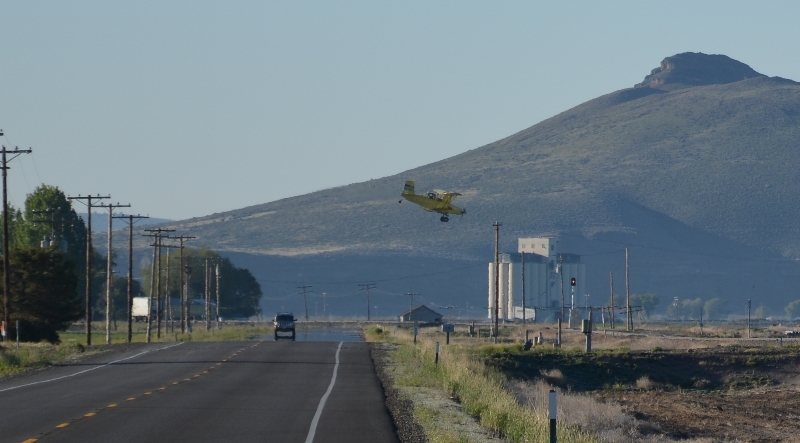 Once I left Tulelake the road continued through agricultural areas. I got a picture of this biplane that was doing crop dusting. 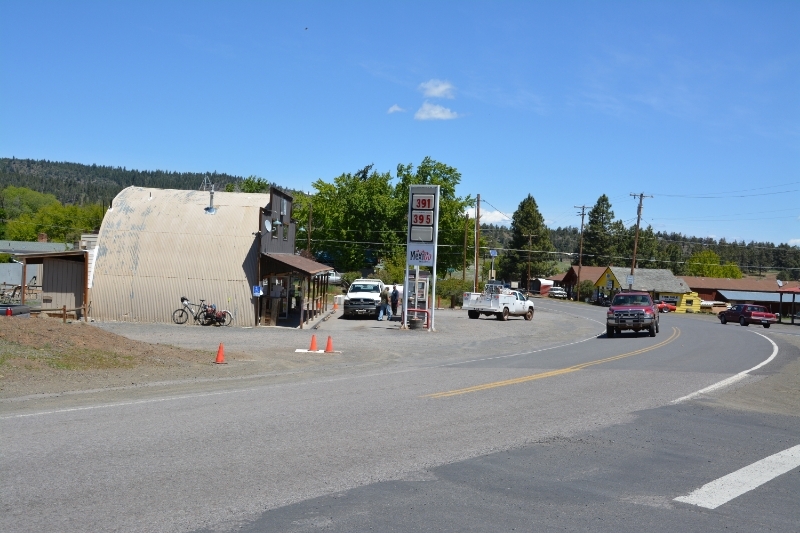 A little further was town of Newell and closest location to the Tulelake internment camp that held up to 18,600 people. Apparently the largest of the 10 camps and the last one to close. Looking from the road and also on google maps, I was surprised to notice that such a large camp had been converted back to agricultural fields and little remained other than the marker above. 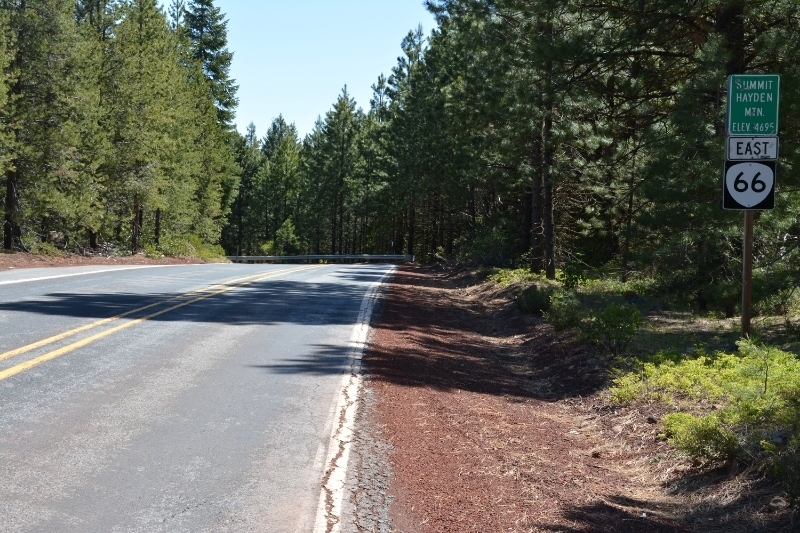 After about 20 miles the road went more through forested areas. It also went through the fruit inspection station shown above. I cycled up and was quickly let through. After this it was some gentle climbs but mostly flat. Also some slight headwinds until 49 miles where the last were a descent to a road intersection at Canby. 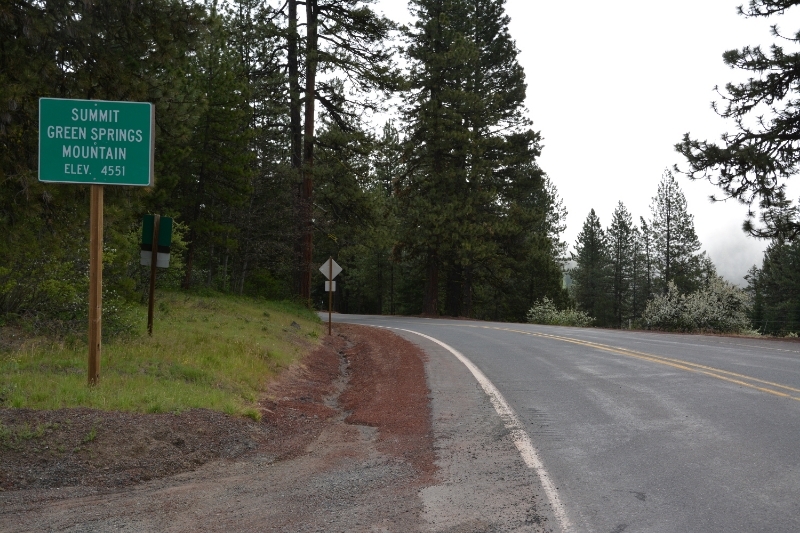 There wasn’t much at Canby at mile 53. 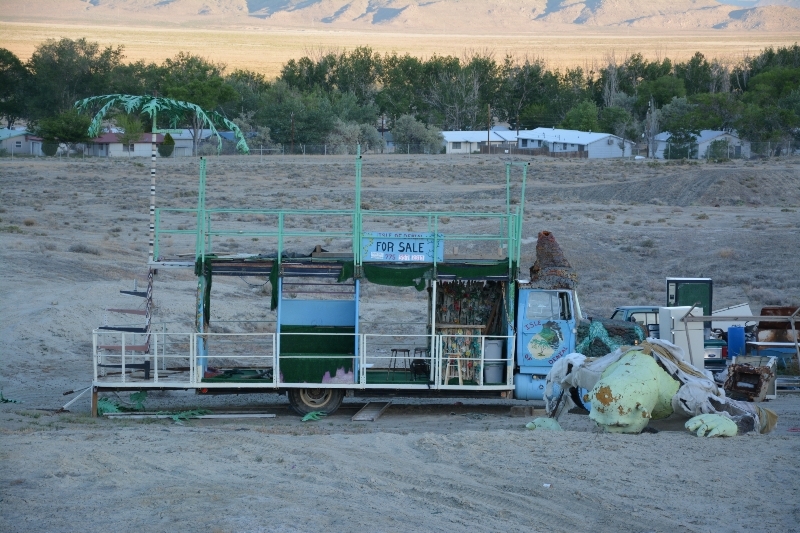 I found the local pit stop market, however it was closed today. If one looks closely you can already see the pumps have been converted to planters. 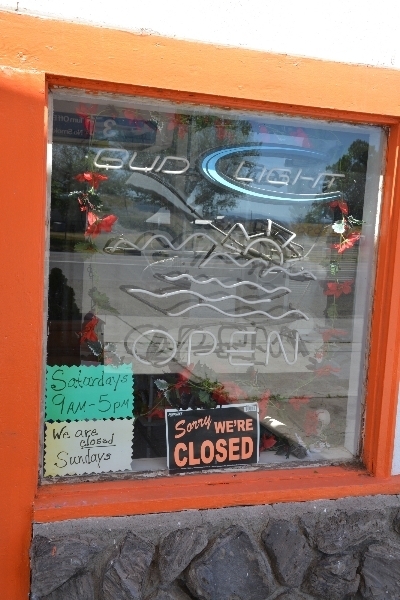 As I looked around town, a local came past and let me know there wasn’t much here open today. 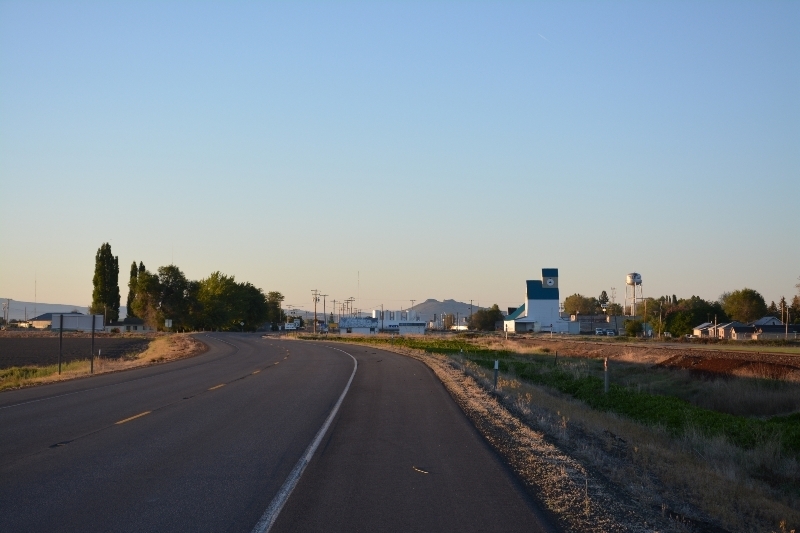 So I cycled west for another 18 miles to Alturas. This was larger town. This was first restaurant I saw, though I continued into town itself and a Subway. At this point the road would climb a bit more. 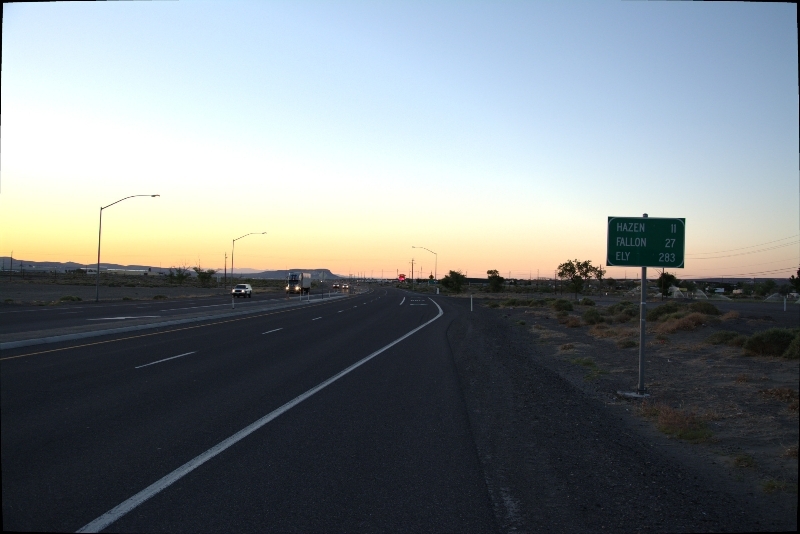 At mile 77 the road turned right and went through a construction zone. There was a pilot car, though I was too slow so mostly rode at my own pace. After the construction area there was a slow climb up to mile 88. 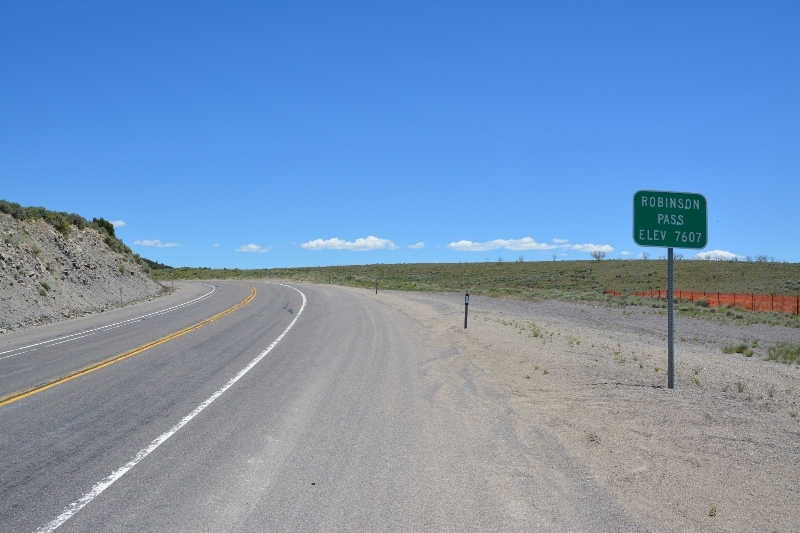 At mile 88 was the summit of Cedar Pass. From here a descent down to Cedarville. Was a nice end to a longer ride. Today had lots of climbing early and then gradually less through the day. 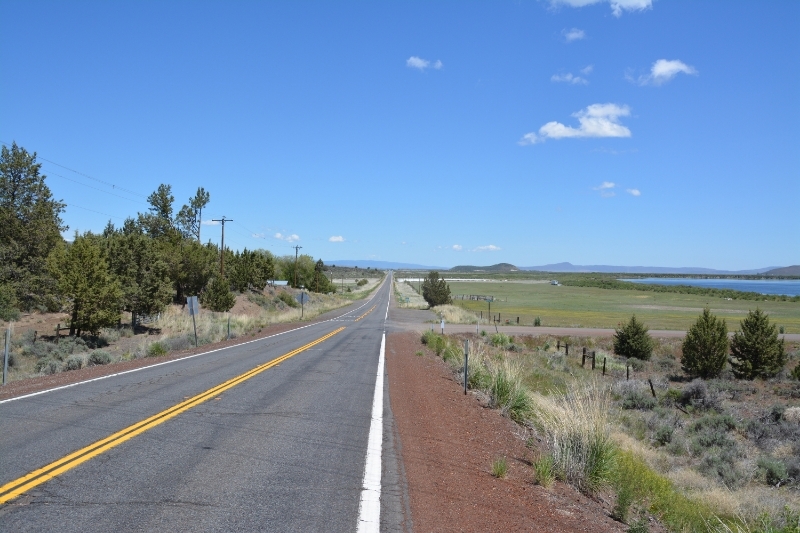 It also got me into drier parts of Oregon. It was overcast and cool when I started out. 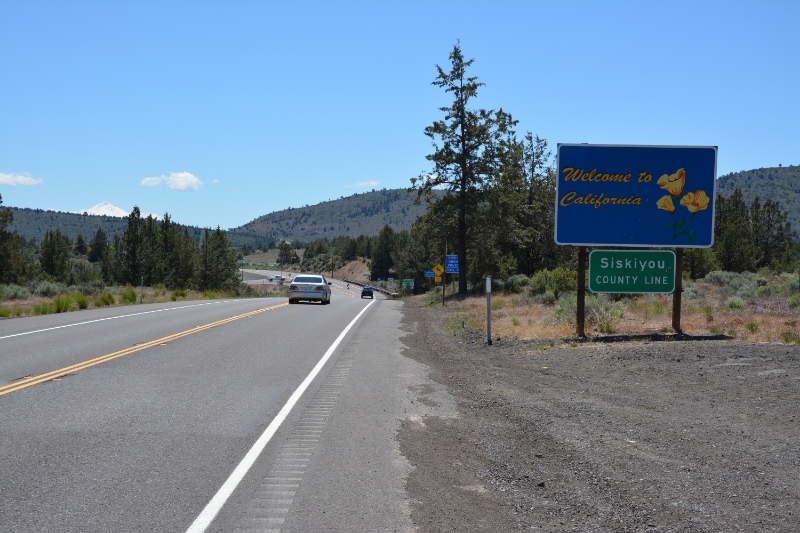 I crossed over I-5 and then followed OR66 where signs already indicated 60 miles to Klamath Falls. 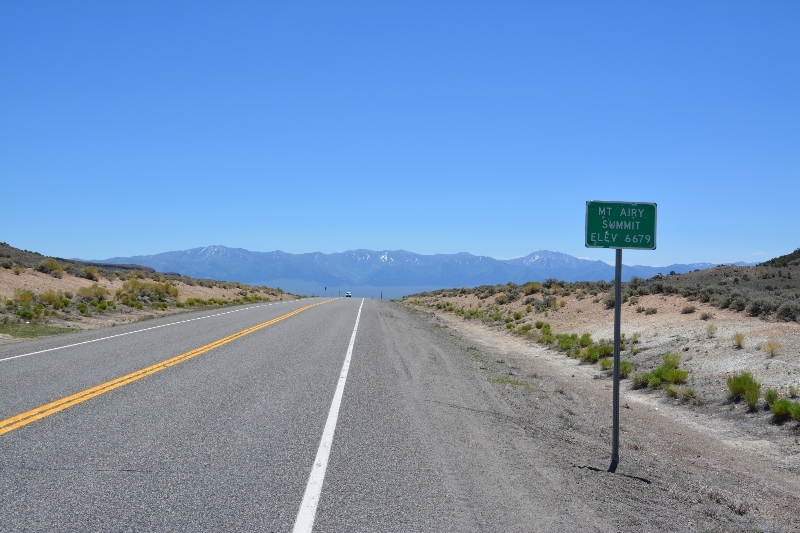 There were a few smaller ups and downs in the first miles as slowly climbed up and past Emigrant Lake. The real climbing started just past Emigrant Lake at 8 miles. Photo above taken part way up the hill with lake in the background. 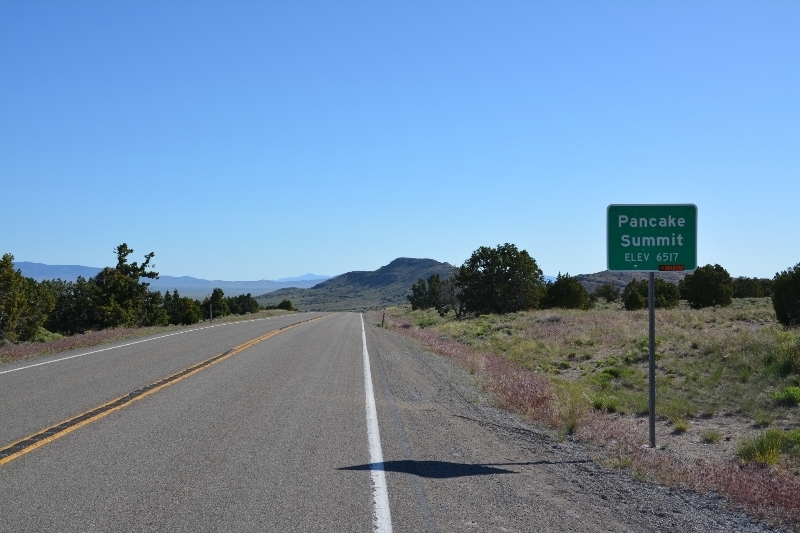 Climbing was fairly steady grade and just before 15 miles I passed “Summit Ranch” so knew I was close. Next photo above taken at top of Green Springs Mountain summit. Ashland was about 2,000ft high so climb itself was about 2,500ft. 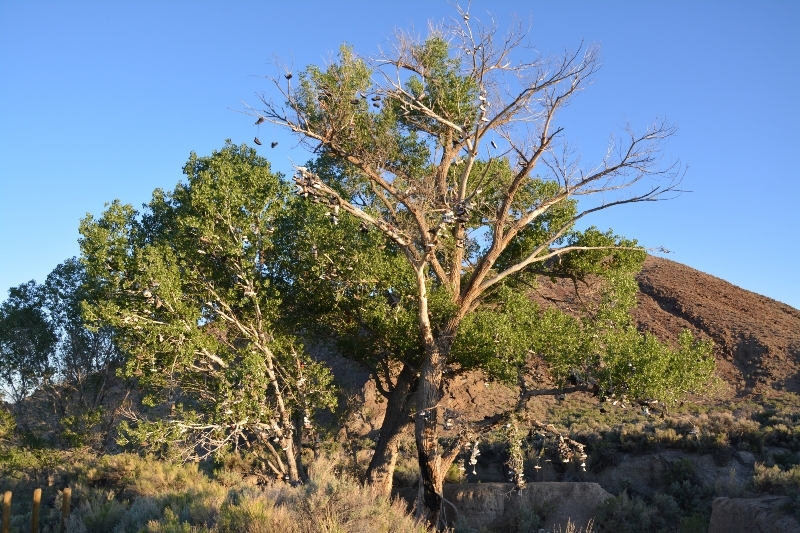 There was a hiking trail here and information about the National Monument in the area. Just after this, the next 8 miles were mostly downhill. They came through small town of Lincoln and also past two different B&B type inns. At 23 miles was at a low point and started climbing again until mile 28 for the next summit. 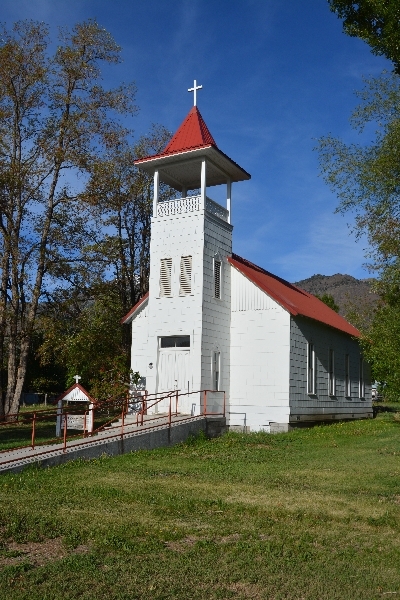 The second summit was Parker Mountain. By now it had gotten warm enough and sunny enough to change from jacket. Next downhill wasn’t as far and then started climbing to 36 mile point to reach Hayden Mountain. After this still some ups and downs though no new summits. 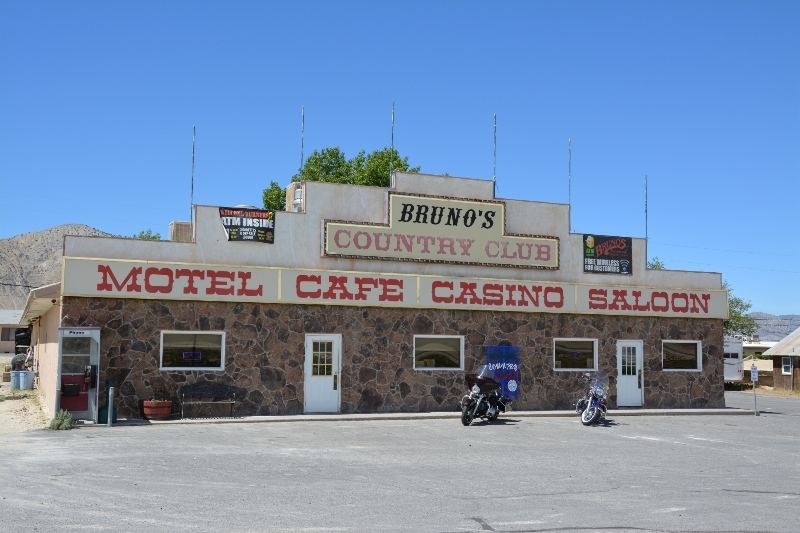 I came into road junction at Keno at 49 miles and was ready for lunch. Saw a cafe sign, but workers there told me they weren’t open yet. So at main road junction was gas station that also made Mexican food. 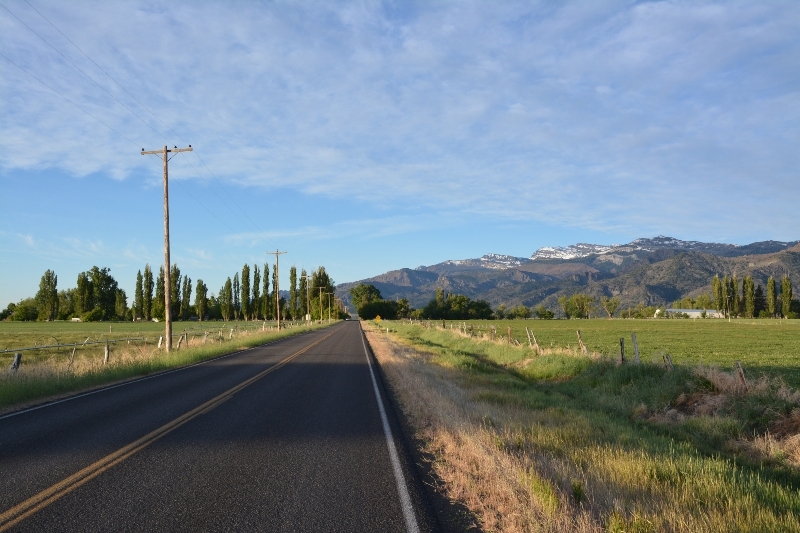 After Keno, went on side road via Worden. The landscape changed on way here. 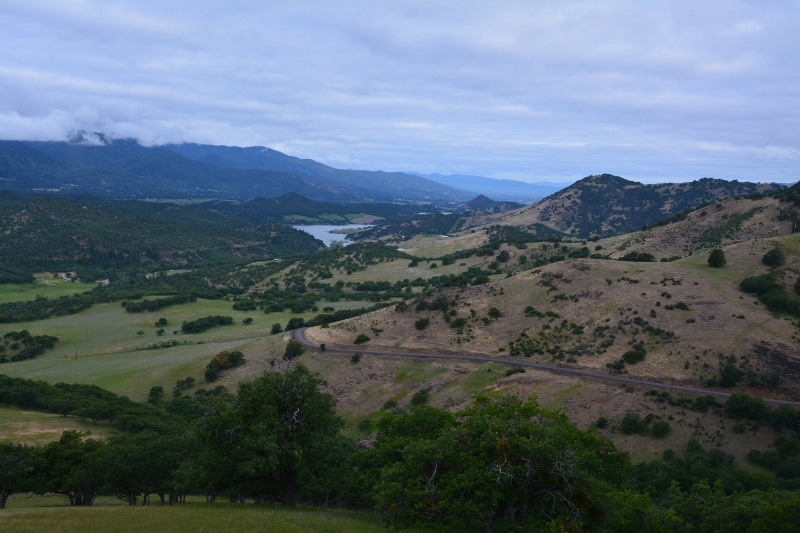 Instead of pine forest, this was open valley and some farmland. The road was smaller but at 58 miles joined up with US 97. 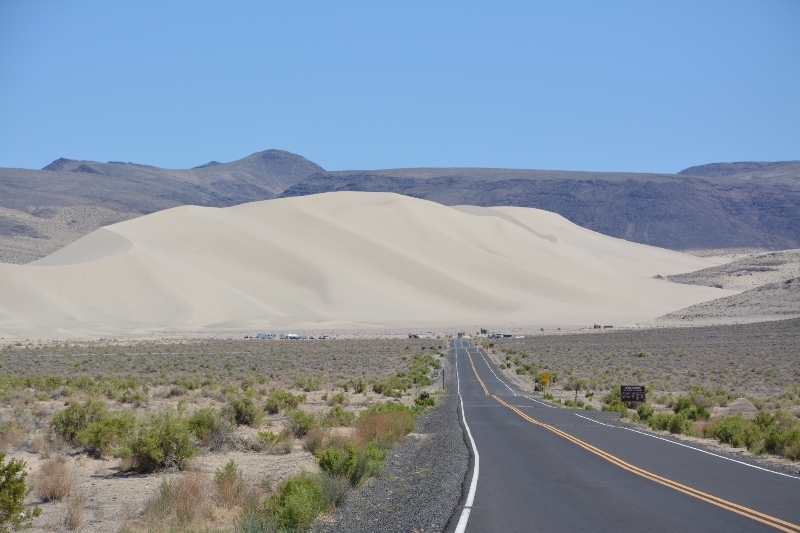 US 97 had wide shoulder but also a lot of truck traffic, I assume this was the cutover from I-5 inland to Oregon. 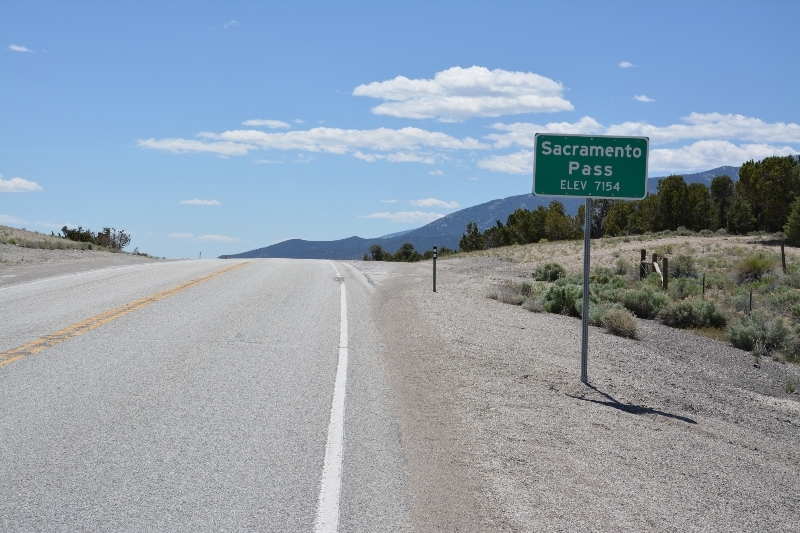 At 59 miles I came to the border of California and shortly thereafter turned onto a smaller “stateline road” also known as CA 161. 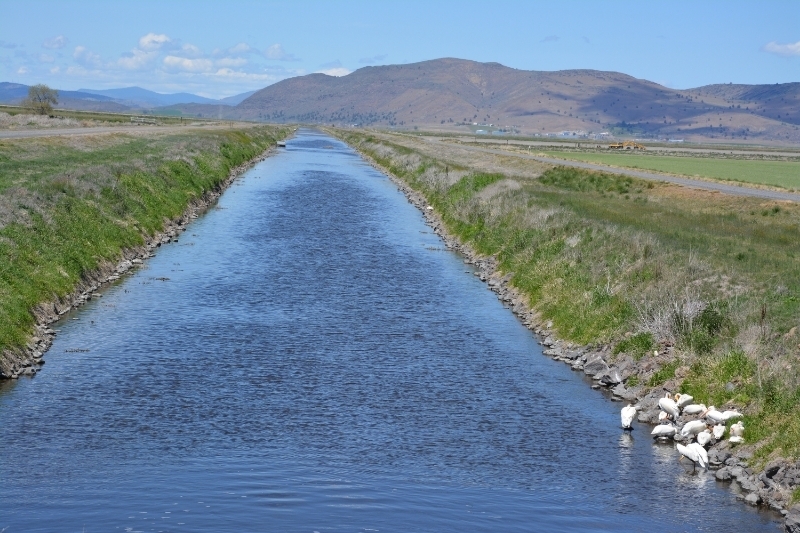 In contrast to earlier in the day, CA 161 was almost flat as it went along a marshy wildlife area. It was good cycling and I saw pelicans below as well as a number of other birds. 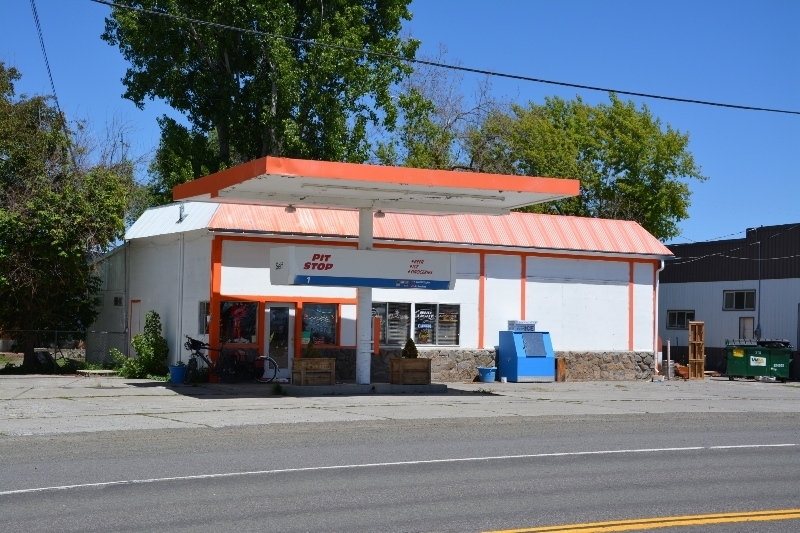 Stopped at a gas station for some food at 77 miles and then turned south to Tulelake on CA 139. Also good shoulder though looks like less traffic. 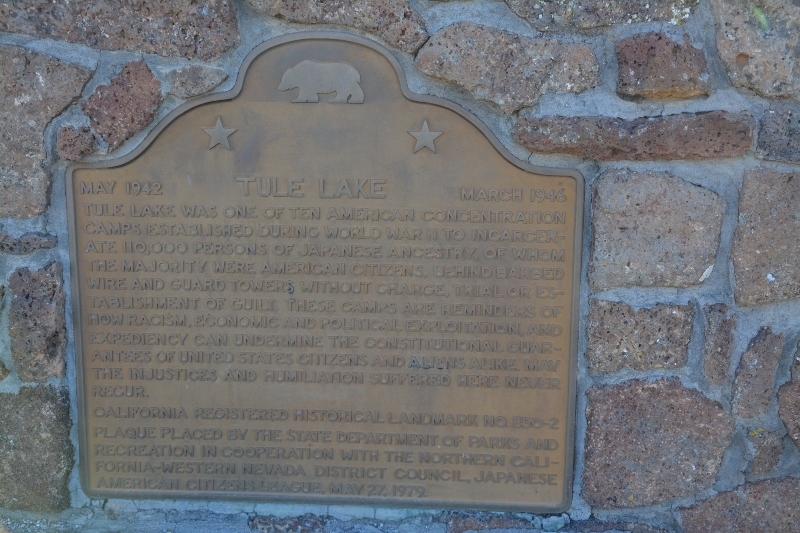 Th e motel is still north of Tulelake but believe south of town some miles is site of a camp where 18,600 Japanese Americans were interned during the second world war.